Young-Earth Creationist Helium Diffusion "Dates"
acknowledged and the text is not altered, edited or sold. This revision is a reply to Humphreys (2005) (pdf version), which is a cursory response to my original essay. evasions and misrepresentations in his most recent January 2006 "reply" at "TrueOrigins." What Dr. Humphreys' data really say. Using the best available data, the "creation dates" from the equations in Humphreys et al. (2003a) provide ridiculous answers that range from hundred to millions of "years" (an average and two standard deviations of 60,000 ± 400,000 "years" old, using only one significant digit). Because Dr. Humphreys' helium diffusion data were obtained under a vacuum rather than under pressures that realistically model the subsurface conditions at Fenton Hill, the actual helium diffusion results at Fenton Hill are probably orders of magnitude lower as illustrated by the blue arrows. The graph also shows a linear extrapolation of the intrinsic curve, which is based on procedures in Lippolt and Weigel (1988). At about 100°C, the intrinsic curve passes very close to the "uniformitarian model." Depending on whether extraneous helium is present in the zircons, the "dates" of the "uniformitarian model" may range from less than 10,000 years to 1.6 billion years. Dr. D. R. Humphreys and other young-Earth creationists (YECs) believe that zircons from the Fenton Hill rock cores, New Mexico, USA, contain too much radiogenic helium to be billions of years old (Humphreys et al., 2003a,b, 2004; Humphreys, 2003). In my original essay, I extensively criticized and documented some of the numerous problems in Dr. Humphreys' work. Rather than dealing with most of his mistakes, it's obvious that Humphreys (2005) did not even read and comprehend the vast majority of my criticisms. This essay contains additional evidence and discussions that demonstrate that Dr. Humphreys' work is fatally flawed and never achieves its YEC objectives. Throughout Humphreys (2005), Dr. Humphreys stresses that his YEC conclusions must be correct because his Figure 2 shows a supposedly strong correlation between his "creation model" and vacuum helium diffusion measurements from Humphreys (2003a, 2004). However, Dr. Humphreys' diagram has little scientific merit. First of all, his helium diffusion experiments were performed under a vacuum rather than at realistic pressures that model the subsurface conditions at Fenton Hill (about 200 to 1,200 bars; Winkler, 1979, p. 5). McDougall and Harrison (1999), Dalrymple and Lanphere (1969) and many other researchers have already shown that the diffusion of noble gases in silicate minerals may decrease by at least 3-6 orders of magnitude at a given temperature if the studies are performed under pressure rather than in a vacuum. Secondly, because substantial extraneous helium currently exists in the subsurface of the Valles Caldera, which is only a few kilometers away from the Fenton Hill site, Dr. Humphreys needs to analyze his zircons for 3He, and quartz and other low-uranium minerals in the Fenton Hill cores for extraneous 4He. Thirdly, chemical data in Gentry et al. (1982b) and Zartman (1979) indicate that Humphreys et al. and Gentry et al. (1982a) may have significantly underestimated the amount of uranium in the Fenton Hill zircons, which could reduce many of their Q/Q0 values by at least an order of magnitude and substantially increase Humphreys et al. 's "creation dates." Dr. Humphreys needs to perform spot analyses for 3He, 4He, lead, and uranium on numerous zircons from all of his and R. Gentry's samples so that realistic Q/Q0 values may be obtained. The "dating" equations in Humphreys et al. (2003a) are based on many false assumptions (isotropic diffusion, constant temperatures over time, etc.) and the vast majority of Humphreys et al. 's critical a, b, and Q/Q0 values that are used in these "dating" equations are either missing, poorly defined, improperly measured or inaccurate. Using the best available chemical data on the Fenton Hill zircons from Gentry et al. (1982b) and Zartman (1979), the equations in Humphreys et al. (2003a) provide ridiculous "dates" that range from hundreds to millions of "years" old (average: 60,000 ± 400,000 "years" old [one significant digit and two standard deviations] and not 6,000 ± 2,000 years as claim by Humphreys et al., 2004). Contrary to Humphreys (2005), his mistakes are not petty or peripheral, but completely discredit the reliability of his work. Humphreys (2005) repeatedly challenges me to publish my criticisms of his work in a peer-reviewed scientific journal. However, when compared with Talkorigins, few individuals read science journals. Besides, YEC publications have earned no respect in the scientific community and, whether justified or not, authentic science journals are no more likely to accept a critique of his Creation Research Society Quarterly (CRSQ) article (Humphreys et al., 2004) than a rebuttal of the astrology columns and Big Foot articles in the National Enquirer . It's obvious from Dr. Humphreys. publication record on this topic (i.e., Humphreys et al., 2003a,b; Humphreys, 2003; Humphreys et al., 2004) that he has no real interest in fully presenting his ideas for critical scrutiny from some of the world.s authorities on zircon and helium chemistry. So, before Dr. Humphreys screams about the importance of peer-review, he needs to follow his own advice. He needs to openly and completely publish his work and conclusions as a full article in a legitimate peer-reviewed science journal (such as Geochimica et Cosmochimica Acta or American Mineralogist ). Suitably peer-reviewed documents don't include a brief abstract in EOS and YEC proselytizing materials edited by his friends and/or fellow RATE members. If Dr. Humphreys is really sincere about his devotion to peer-review, let him wean himself off the reliance on miracles for his .accelerated radioactive decay. claims, honestly recognize and correct his numerous mistakes, and submit what's left as a detailed article in a real science journal. For decades, young-Earth creationists (YECs) have desperately sought "scientific evidence" to attack radiometric dating and protect their religious views of Earth history. Although YECs claim to believe that the Bible is the "powerful word of God", they fully realize that just quoting their scriptures is not going to convince geochronologists and other scientists to abandon their research and stream to church altars in repentance. Therefore, a small group of YEC Ph.D.s associated with the Institute for Creation "Research" (ICR), the Creation "Research" Society (CRS) and formerly "Answers" in Genesis (AiG) formed the RATE (Radioisotopes and the Age of The Earth) committee (Vardiman et al., 2000; Humphreys et al., 2004, p. 3). Simply put, their activities include combing the scientific literature and designing laboratory "experiments" that will somehow verify what they have already concluded, namely that a "literal" interpretation of Genesis is "The Truth" and anything that conflicts with their biblical interpretations is "wrong." In 2003, many Christian fundamentalists became very excited about a RATE project in Humphreys et al. (2003a), Humphreys et al. (2003b) and Humphreys (2003). Humphreys et al. (2003a) claim that zircons from the "Jemez granodiorite" of the Fenton Hill rock core, New Mexico, USA, contain too much "radiogenic" helium to be billions of years old. By inaccurately modeling the helium diffusion rates in the zircons, making numerous invalid assumptions and assuming some unfounded miraculous increases in radioactive decay rates, Humphreys et al. (2004) concluded that the zircons are only "6,000 ± 2,000 years old." Not surprisingly, their results conveniently straddle Bishop Ussher's classical 4004 BC "Genesis creation date" for the world. Since 2003, several individuals have criticized the validity of Humphreys et al. 's claims. Humphreys (2005) is a superficial response to criticisms in my original essay. The vast majority of the errors and unsound assumptions in the Humphreys et al. documents are not the "mountain of minutiae" as claimed by Humphreys (2005), but serious mistakes that completely invalidate any confidence in his work and claims. A few of the major flaws in the Humphreys et al. documents are discussed below. Contrary to the misconceptions in Humphreys (2005), the scientific method is not a matter of my tastes or his, but is based on a set of rules that Dr. Humphreys simply does not understand or comply with. The rules of the scientific method do not allow individuals to invoke miracles to eliminate scientific data (i.e., U/Pb dates) and questions that they don't like. Because miracles by definition don't obey natural law, are only limited by an individual's subjective imagination, and can be readily remolded to explain away any failures, any "models" based on the supernatural can never be scientifically evaluated for accuracy or predictability. Scientists have made enormous advances in the past few centuries. These advances did not develop because scientists relied on miracles or other flimsy excuses to cover up problems and promote religious or political agendas. How much expertise does it take to say "God did it!"? Proclaiming "God did it!" is clearly not an acceptable answer in criminal forensics, weather forecasting, or any other scientific pursuit. Would the invoking of miracles ever be tolerated in a court room, medical school or anywhere else outside of a religious forum? If psychologists don't blame demons for causing manic depression, car mechanics don't blame gremlins for engine problems, and forensics scientists don't invoke witchcraft to solve unwitnessed crimes, what makes Dr. Humphreys believe that geologists should use the supernatural to explain the origin of a rock? As explained below, it's totally premature and irrational for Dr. Humphreys to rely on faulty data, equations, and magic just to promote a religious agenda to his liking. Because YECs are often willing to "resolve" any problems or prop up any of their religious ideas with unfalsifiable ad hoc miracles, they really don't produce scientific results or models. To be exact, Dr. Humphreys' "accelerated nuclear decay event" is nothing more than an example of the infamous Gosse (Omphalos) (also here) and "god of the gaps" (also here) fallacies. Obviously, there are major and critical differences between many YEC "researchers" and real scientists. Real scientists pay attention to details in their research, evaluate multiple natural hypotheses, see where their research takes them, and ignore any pronouncements from the Humanist Manifesto , the Bible , the Book of Mormon , or the Koran . That is, authentic scientists would never allow religious or political commissars to dictate to them which of their results are "acceptable" and which are not, yet Dr. Humphreys and other RATE committee members have a Hebrew language scholar looking over the shoulders to make sure that the members "stay on course" (Morris, 2000, p. viii). Because YECs already believe that they have "The Answers" in their Bibles, they tend to take an "ends justifies the means" approach to "research," which often leads to careless actions, including: taking unjustified shortcuts (such as, assuming isotropic diffusion in biotites), being inexcusably careless with data (for example, listing the wrong units of measure in Appendix C of Humphreys et al., 2003a), and overlooking alternative natural explanations that conflict with their agenda (as examples, much slower helium diffusion under subsurface pressures). After all, getting the "biblically correct answers" and protecting their faith are paramount for many YECs. In reaction to my criticisms that he is trying to eliminate sound U/Pb radiometric dates with groundless miracles, Humphreys (2005) attempts to minimize his religious agenda by claiming that he only spent a few paragraphs in his documents arguing that God miraculously altered radioactive decay rates. That is, Humphreys (2005) claims that his data are the "main subject" of his work and not the supposed role of God in accelerating radioactive decay rates. Yet, the YEC public doesn't buy into this. YECs don't care about the esoteric calculus equations in Humphreys et al. (2003a). It's obvious from the countless fundamentalist Christian Internet sites that cite Humphreys et al. 's work that YECs consider the few accelerated radioactive decay paragraphs to represent the very foundation and the most important part of Humphreys et al. 's work. YECs want converts and not technical science. Finally, if his data are paramount and the role of God in supposedly accelerating radioactive decay rates is not the .main subject. of his work as Humphreys (2005) claims, why didn.t he first publish his work in a secular peer-reviewed science journal instead of YEC pamphlets, Sunday school materials, books and magazines that have no widespread respect in the scientific community? Humphreys (2005) repeatedly challenges me to publish my criticisms of his work in a peer-reviewed scientific journal. Contrary to his hopes, the publications of ICR, CRS and AiG have earned no respect in the scientific community. Authentic science journals are no more likely to accept a critique of his Creation Research Society Quarterly (CRSQ) article (Humphreys et al., 2004) than a rebuttal of the astrology columns and Big Foot articles in the National Enquirer . Also, before Dr. Humphreys screams about the importance of peer-review, he needs to follow his own advice. He needs to openly and completely publish his work and conclusions in a full article in a legitimate peer-reviewed science journal (such as Geochimica et Cosmochimica Acta or American Mineralogist). Peer-review documents don't include a brief abstract in EOS and YEC publications that are edited by RATE members and other YECs, who are more than willing to accept manuscripts that invoke magic to "explain away" scientific problems and questions. It.s obvious from Dr. Humphreys. publication record on this topic (i.e., Humphreys et al., 2003a,b; Humphreys, 2003; Humphreys et al., 2004) that he has no real interest in fully presenting his ideas for critical scrutiny from some of the world.s authorities on zircon and helium chemistry. So, if Dr. Humphreys is really sincere about his devotion to peer-review, let him wean himself off the reliance on miracles for his .accelerated radioactive decay. process, honestly recognize and correct his numerous mistakes, and publish what's left in an authentic peer-reviewed science journal. WHY SHOULD I HELP DR. HUMPHREYS PROMOTE HIS RELIGIOUS AGENDA? Even if I could get a critique of Dr. Humphreys' work published in a peer-reviewed science journal, I would have no interest in doing so. If I did, the editors of the journal would be obliged to provide a forum for Dr. Humphreys to rely. Why should I help Dr. Humphreys get free space in a prestigious journal so that he could simply repeat the errors and evasions of Humphreys (2005)? That is, why shouldn't I expect Dr. Humphreys to misrepresent many of my criticisms, try to trivialize his serious mistakes, invoke more groundless fantasies like he did with sample #5 and the Soviet data (see below), make a couple of corrections here and there but otherwise ignore the details, inconsistently pick and choose values from Gentry et al. (1982a), attempt to mesmerize readers with his Figure 2, promise better answers sometime in the future, and finally hope that his readers swallow his proclamations without wanting to see his math? Also, why should I help Dr. Humphreys add a publication in a prestigious journal to his list of accomplishments and give his work an air of honor and acceptability that it does not deserve? In contrast to peer-reviewed technical journals that have relatively few readers and little space for adequately detailed discussions and calculations, Talkorigins provides a peer-reviewed science forum that has a potential audience of millions and no page limits. Figure 1. Geology of the Fenton Hill GT-2 and EE-2 cores based on information in Laughlin et al. (1983, p. 25, 26) and Sasada (1989, p. 258). The zircons and biotites utilized in Humphreys et al. (2003a, 2004) are from gneisses and not granodiorites. Of course, the sizes of zircons and biotites can be highly variable depending on the host igneous or metamorphic rock. Because Humphreys et al. didn't realize which rocks they sampled and how the sizes of the minerals could vary, serious errors could easily be introduced into the a and b values that are used in their "dating" equations (13-14, 16 and 17 in Humphreys et al., 2003a) (see further discussions below). Chemical data in Gentry et al., 1982b (Adobe Acrobat file) and Zartman (1979) also suggest that the zircons in the different rocks of the Fenton Hill cores have highly variable concentrations of uranium, which would mean that Dr. Humphreys cannot accurately represent the zircons from various depths in the cores with just one Q0 value (see discussions below). "Yes, there are occasional veins of material other than the coarse-grained granodiorite that forms the vast majority [sic] of the core. In making the selections I made of what samples to use, I purposely avoided these occasional veins. In fact I tried to select sections of the core well removed from such veins. So at least from my vantage point, the samples of core we used for the helium diffusion measurements were indeed coarse-grained granodiorite, not gneiss." Dr. Baumgardner's statement that a "coarse-grained granodiorite" forms "the vast majority of the core" blatantly contradicts statements in Laughlin (1981, p. 308) and analytical data in Laughlin et al. (1983), which state that approximately 75% of the cores consist of gneisses (not granodiorite). The dominance of gneisses in the Precambrian rocks of the Fenton Hill cores is obvious in my Figure 1. Because Dr. Baumgardner's conclusions are inconsistent with the results of professional geologists that have examined and analyzed the cores in great detail, I emailed him with a list of questions about the samples that he had collected for Humphreys et al. In his kind reply, Dr. Baumgardner described the core as consisting of dark gneissic "veins" surrounded by an "unaltered granodiorite" consisting of "large (typically, 2-3 mm)" pinkish grains. Although I requested any mineralogical (such as petrographic or X-ray diffraction analyses) or chemical data (that is, major oxides, minor and trace element analyses) that Dr. Baumgardner might have to support his claims, he provided none. By definition (Hyndman, 1985, p. 442), gneisses consist of alternating dark- and light-colored bands and not "veins." If "dark gneiss veins" [sic, bands] were present in Humphreys et al. 's samples, where are the light-colored bands of the gneiss? By the definition of a gneiss, how can the Fenton Hill samples have dark gneiss bands and no light-colored gneissic bands? Dr. Baumgardner seems to have misidentified the light-colored gneissic bands as "unaltered granodiorite." The light-colored layers of a gneiss often consist of blocky feldspar and quartz grains. Without detailed chemical and microscopic studies, feldspars and quartz in a light-colored gneiss can readily appear "igneous" and "unaltered" to the naked eye. Yet, confusing a metamorphic rock for an igneous one is just as serious a mistake as misidentifying a frog as a mammal. In a later email to me, Dr. Baumgardner generously sent photographs of a couple of Fenton Hill cores and described the 750-meter core as a "granite" on the basis of its "abundant" pink orthoclase (potassium feldspar) grains. He further argued that the 1490-meter core was a "granodiorite" because of its lack of pink orthoclase. However, identifying a mineral on the basis of color is unreliable. Orthoclase can come in many colors besides pink. Other minerals besides orthoclase are also pink. Furthermore, pink feldspars can be abundant in some gneisses and entirely absent in others. Even if the samples were igneous, Dr. Baumgardner's naked-eye observations would not have been adequate enough to distinguish a granodiorite from a granite, monzonite, or any other intermediate or felsic intrusive igneous rock. Again, Humphreys et al. have yet to produce any definitive chemical or microscopic evidence to challenge the metamorphic identifications of their samples in Laughlin et al. (1983) and other documents. MISIDENTIFIED ROCKS ULTIMATELY UNDERMINE DR. HUMPHREYS HELIUM DIFFUSION "DATES"
"The important point is that, regardless of the name we put on the rock unit, the zircons throughout it have been measured to contain essentially the same amounts and ratios of lead isotopes (Gentry et al., 1982b), and therefore have undergone the same amount of nuclear decay. The uranium, helium, and lead levels in our samples are perfectly consistent with the corresponding levels Gentry reported for his. The effect of variation from sample to sample is probably smaller than the 2-sigma error bars around our prediction. So here Henke is making a distinction without a difference." "Frequently, there were significant differences in the U and Th concentrations from two different locations on the same zircon." As shown in my Appendix B and associated discussions in this and my original essay, orders of magnitude variations in the uranium and thorium concentrations of the Fenton Hill zircons would produce orders of magnitude variations in Q/Q0 values. Because Dr. Humphreys did not fully realize that his and R. Gentry's teams had sampled zircons from a diverse group of igneous and metamorphic rocks (Figure 1 and my Table 1, below), Dr. Humphreys did not carefully consider that the uranium, Q/Q0, and a values of the zircons from these rocks could be extremely different, which would greatly impact his "helium diffusion dates." As discussed below, this oversight alone nullifies the "helium diffusion date" of 6,000 "years" in Humphreys et al. (2004). YECs might argue that because Precambrian granodiorites and gneisses were all magically zapped into existence during the six 24-hour days of the "Creation Week" (e.g., Snelling and Woodmorappe, 1998, p. 530), distinctions between Precambrian rocks really aren't important. While most YECs invoke miracles to explain away most Precambrian intrusive rocks (e.g., Snelling and Woodmorappe, 1998, p. 530), Humphreys et al. (2003a, p. 2) unintentionally admit that at least some intrusive rocks have significant histories when they claim that zircon crystals become imbedded in larger crystals as a magma "cools and solidifies." So, Dr. Humphreys has the impossible task of explaining why the numerous metamorphic and igneous rocks in the Fenton Hill cores (my Figure 1) have complex structures and textures that indicate a long history (Laney et al., 1981, Laughlin and Eddy, 1977, Laughlin et al., 1983, Sasada, 1989 and their references) rather than a supposed rapid and miraculous formation in only six 24-hour creation days. Like an old scratched phonograph record or a dented old car (scroll down), the properties of a metamorphosed rock often indicate an extensive and complex history involving erosion of precursor igneous, sedimentary and metamorphic rocks; sediment deposition; deep burial of sediments; multiple cooling and heating events; various complex metamorphic reactions; faulting and uplifting. 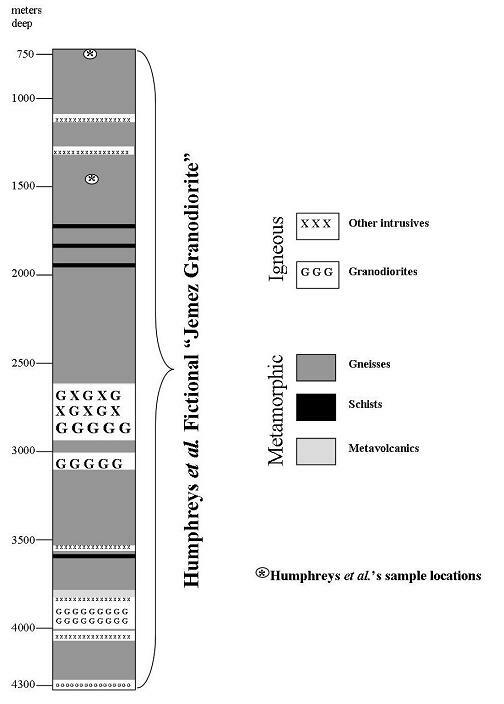 Humphreys (2005) admits that he "invented" the term "Jemez granodiorite" to describe all of the Precambrian rocks in the Fenton Hill cores. However, the U.S. Geological Survey's (USGS) Geologic Names Committee and the North American Stratigraphic Code maintained by The North American Commission on Stratigraphic Nomenclature long ago established rules that professional geologists must follow if they want to introduce a name for a rock unit into the literature. The USGS Geologic Names Committee also maintains a searchable on-line database of accepted names for American geological units. Dr. Humphreys and his colleagues violated these rules when they lumped together all of the diverse Precambrian metamorphic and igneous rocks of the Fenton Hill cores and misnamed them the "Jemez granodiorite" (Figure 1). Dr. Humphreys has not only produced a bogus name for these rocks that could eventually spread clutter and confusion in the literature, he has also shown his inability to properly identify rocks and further demonstrated that he is incapable of following established scientific rules. According to Humphreys et al. (2003a, p. 6, 17) and Humphreys (2005), the Institute for Creation "Research" (ICR) laboratory extracted the biotite samples for the helium diffusion studies in Humphreys et al. (2003a). The results in Appendix B of Humphreys et al. (2003a) indicate that the Fenton Hill biotites were impure. As shown by candid statements from ICR's Dr. Steve Austin, the ICR laboratory has a history of not being able to consistently provide adequate mineral and volcanic glass separations (also see: "Young-Earth Creationist 'Dating' of a Mt. St. Helens Dacite: The Failure of Austin and Swenson to Recognize Obviously Ancient Minerals"). As I stated in my previous essay, which Humphreys (2005) ignores, adequately pure biotite separations may not be possible for the Fenton Hill samples. Certainly, Humphreys (2005) is correct when he states that different samples provide different degrees of difficulty in mineral separation. That is, another laboratory also may not have been able to adequately separate the biotites from the Fenton Hill samples. However, considering the poor record of the ICR laboratory, Dr. Humphreys should have at least tried. Humphreys (2005) again tries to belittle his failures by claiming that the biotite separations are irrelevant. However, if these separations were not important, why did he bother having them done and the questionable helium analyses published? It's obvious that without these biotite analyses, Dr. Humphreys' case is weakened. For example, sample #6 doesn't fit into their modeling scheme (see discussions below). So, Humphreys et al. (2003a, p. 3, 8) used their questionable biotite analyses to argue that sample #6 is a "special case" and can be ignored in their "models" (see discussions below). Instead of adequately responding to the questionable Fenton Hill results from the ICR laboratory, Humphreys (2005) challenged me to do a better job. But, why should I do his work for him? I simply have no interest in processing samples for Dr. Humphreys so that he can manipulate them to promote his YEC agenda. In response to my criticism of the ICR laboratory, Humphreys (2005) mentions the good helium results on the biotites of the "Beartooth gneiss," which are also listed in Humphreys et al. (2003a, their Appendix B). However, the USGS database and the literature databases Georef and Web of Science contain no references to the existence of the "Beartooth" or "Bear tooth" gneiss. This is probably another rock name that was pulled out of the ether by YECs at the ICR. Considering their inabilities to distinguish metamorphic from intrusive igneous rocks when they named the "Jemez granodiorite," who knows if this rock is even a gneiss. Nevertheless, even if the ICR laboratory successfully separated biotites from the "Beartooth gneiss," we still don't know if the ICR's overall failures with the Mt. St. Helens and Fenton Hill samples were due to inadequate laboratory procedures, improperly trained personnel or the nature of the samples. Another laboratory should have processed these samples. Humphreys et al. (2003a, p. 17) states that the biotites from the "Beartooth gneiss" and the "Jemez granodiorite" were extracted through "crushing, magnetic separation, and density separation with heavy liquids." However, silicate minerals can lose much of their helium through crushing (Trull and Kurz, 1993, p. 1314; Mussett, 1969, p. 298). Allowing the ICR laboratory to grind the biotite specimens could have resulted in substantial helium loss and significant errors in Appendix B of Humphreys et al. (2003a). Some researchers have cut rather than crushed micas for argon diffusion studies (Dalrymple and Lanphere, 1969, p. 147-148). "I further pointed out that the zircons would have to be colder than dry ice [ CRSQ 2004, p. 9] for most of their history in order to save the 1.5 billion year scenario, and no geologist would consider such a low temperature to be in the realm of possibility." Rather than invoke strawperson fallacies based on unrealistic temperatures, Dr. Humphreys needs to look at how he unrealistically applies vacuum helium diffusion data to high-pressure subsurface conditions. On Earth, no geologist would consider such low pressures to be in the realm of possibility. A major assumption of Humphreys et al. 's work is that helium diffusion measurements obtained under a laboratory vacuum (for example, Appendix C of Humphreys et al., 2003a) are essentially the same as natural diffusion coefficients at depths of 750 - 4310 meters in the subsurface of Fenton Hill (about 200 to 1,200 bars of pressure; Winkler, 1979, p. 5). Contrary to the assumptions of Humphreys et al., helium should more readily degas from a bare zircon in a rapidly heated laboratory vacuum than from a deep subsurface zircon that is surrounded by impermeable minerals and high-pressure fluids. Numerous researchers have shown that the diffusion of helium or argon in silicate minerals may vary by many orders of magnitude at a given temperature depending on whether the studies were conducted in a vacuum or under pressure. For example, argon diffusion in phlogopite mica may be at least 3 to 6 orders of magnitude higher in a vacuum than under pressurized conditions (McDougall and Harrison, 1999, p. 154). Argon diffusion in glauconite at 1,000 to 10,000 psi of water vapor is up to three orders of magnitude slower than under a vacuum (Dalrymple and Lanphere, 1969, p. 155). Lippolt and Weigel (1988, p. 1451) also question whether laboratory vacuum experiments adequately model the degassing behavior of certain minerals under natural conditions. These issues must be kept in mind when evaluating Humphreys et al. 's "models," especially with their biotite data. 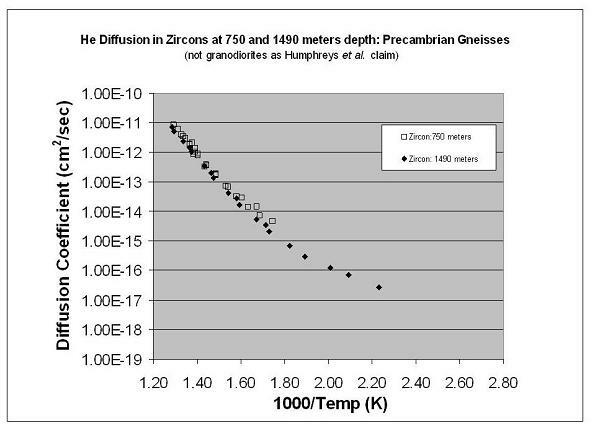 At most, Figure 2 of Humphreys (2005) may simply indicate that the Fenton Hill zircons could take thousands of years to degas under a laboratory vacuum. So, before Humphreys (2005) can make any claims about his Figure 2 validating the "creation model," he needs to measure helium diffusion under realistic pressures, perhaps similar to the high-pressure garnet studies in Dunai and Roselieb (1996). If he and his colleagues perform these high-pressure experiments, they could find that the helium diffusion results more closely comply with the "uniformitarian model" than their vacuous "creation model." The failure of Humphreys et al. to study helium diffusion under natural pressures, by itself, is probably more than able to kill the validity of this YEC project. Instead of dealing with these issues, Humphreys (2005) just keeps referring to his pretty Figure 2 and repeating how well the helium diffusion measurements "align" with his "creation model." If Dr. Humphreys is really so confident of his diagram, why hasn't he fully presented his results to expert peer-reviewers of a secular science journal? Also, what if the alignment between the vacuum diffusion data and the "creation model" is nothing more than a fluke? Considering how the Q/Q0, a, and b values and the equations that produced the "creation dates" have been manipulated (see discussions below), a fluke may not be as improbable as Humphreys (2005) believes. YEC John Woodmorappe, who mistakenly believes that most radiometric dates are nothing more than products of chance (i.e., Woodmorappe, 1999), might have better luck looking for false linear trends in the Humphreys et al. documents. Humphreys (2005) accuses me of lying when I stated in my original essay that Humphreys et al. (2003a) fudged some old Soviet helium diffusion data from Magomedov (1970). But how else can we describe the actions of Humphreys et al. (2003a)? Without any legitimate justification and in contradiction to the helium activation energy of 15 kcal/mole in Magomedov (1970), Humphreys et al. (2003a) changed the units of measure on the y-axis of the Magomedov (1970) graph from natural logs to base 10 logs so that the Soviet data lined up with their and Reiners et al. 's (2002) results (my Figure 2; Figures 5 and 6a and p. 11 in Humphreys et al., 2003a). In the process of fudging the units on the y-axis, the slope of the intrinsic curve changed. Because the slope of the intrinsic curve determines the activation energy of the sample, the activation energy of the base 10 log intrinsic curve no longer complies with Magomedov's value of 15 kcal/mole. Like the 29-44 kcal/mole results in Humphreys et al. (2003a, p. 7) and Reiners et al. (2002, p. 301), the activation energy of the base 10 log curve is now about 40 kcal/mole (my Figure 2). Figure 2. Arrenhius plot of helium diffusion in zircons from the Soviet Union (gray triangles; Magomedov, 1970), Nevada (black circles; Reiners et al., 2002) and the Fenton Hill core (black diamonds; Humphreys et al., 2003a) (based on Figure 5 of Humphreys et al., 2003a). Magomedov (1970) reported that the activation energy of his zircons was 15 kcal/mole, which is consistent with the slope of the intrinsic portion of the ln D curve (gray triangles). When Humphreys et al. (2003a, p. 6) improperly changed the diffusion units of the Magomedov data from natural log (ln) to log base 10 (log) (gray squares) to correspond with their and the Reiners et al. results, the activation energy became approximately 40 kcal/mole, which contradicts the results in Magomedov (1970). "Measurements of noble gas diffusion in a given type of naturally occurring mineral often show significant differences from site to site, caused by variations in composition." So, when individuals (like Dr. Humphreys) manipulate a data set to comply with the results that they want and then boast that their results are "consistent" with the manipulation (Humphreys et al., 2003a, p. 11), THAT IS FUDGING. Dr. Humphreys' misuse of the Magomedov data shows that he is willing to do just about anything if an opportunity arises to manipulate a data set to promote his YEC agenda. The deceptive effects of Dr. Humphreys' manipulation of the Magomedov (1970) data have already spread into the mainstream peer-reviewed scientific literature via a 2004 article by YEC Mark Armitage. Armitage (2004, p. 19) claims that the Reiners et al. 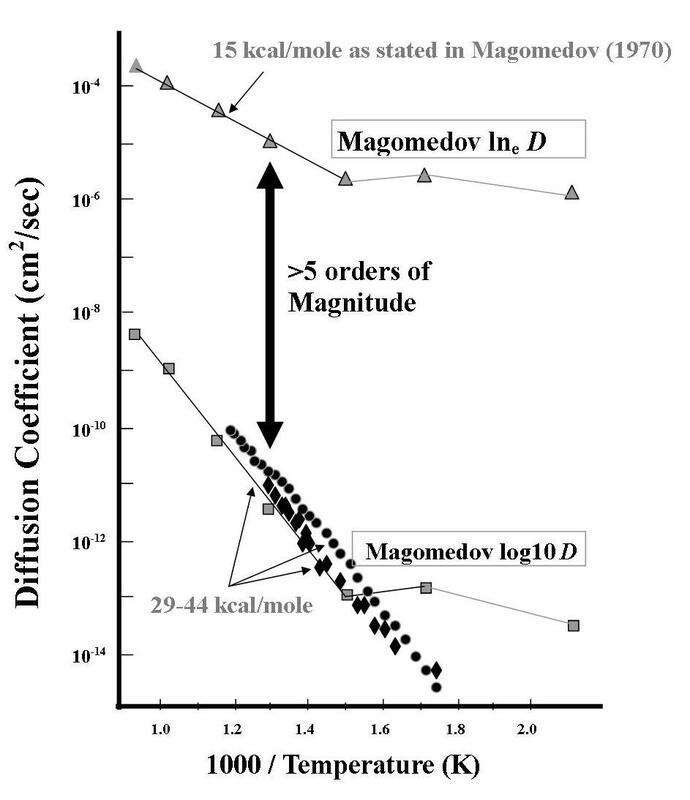 (2002) data "lined up well" with the results from Magomedov (1970). Of course, the Magomedov and Reiners et al. results ONLY "lined up well" after Magomedov's data had been fudged as shown in Figure 5 of Humphreys et al. (2003a, p. 6) (also see my Figure 2). WHO'S REALLY INCONVENIENCED BY THE MAGOMEDOV DATA? Dr. Humphreys admits in Humphreys et al. (2003a, p. 6) and Humphreys (2005) that the Soviet data are ambiguous. So, if Dr. Humphreys recognizes that these data are ambiguous, why didn't he simply discard them? Instead of discussing the activation energy of the Magmedov data and adequately explaining his manipulation, Humphreys (2005) accuses me of just wanting to reject the Magmedov data because I find them "inconvenient." In reality, it was Humphreys et al. (2003a) that found the extremely fast helium diffusion results from Magomedov (1970) to be so inconvenient that they manipulated the units of measure to protect their "creation date" of 6,000 years. Without fudging the Soviet data, Dr. Humphreys is put into an extremely inconvenient position of trying to explain why these Soviet results are several orders of magnitude higher than his measurements (my Figure 2) and why his "dating" equations would probably indicate that these Soviet zircons were "created" in the 20th century. To be exact, when Humphreys (2000, p. 347) applied the natural log (unmanipulated) Magomedov diffusion results to Fenton Hill sample #1, he got a ridiculous "creation date" of 23 years! Although the natural log Magomedov data support my arguments by exposing the ridiculous nature of Humphreys et al. 's "dating" equations, I still advocate discarding them because they were probably produced on antiquated equipment and they were not unambiguously listed as numbers in a table. While Dr. Humphreys is willing to manipulate ambiguous data produced with 35 year-old Soviet technology or the claims of ancient Middle Eastern texts, scientists would want state-of-the-art results (for example, as discussed below, the lead data from Lee et al., 1997 and Cherniak and Watson, 2000, and not outdated results from Magomedov, 1970). Humphreys et al. (2003a, p. 5) assume that Arrhenius graphs typically, if not always, have defect lines. However, Reiners et al. (2002) and Lippolt and Weigel (1988) contain examples without defect lines. The absence of defect lines on Arrhenius graphs has significant ramifications for Humphreys et al. 's "creation" and "uniformitarian models." Rather than faithfully reproducing an Arrhenius graph from Lippolt and Weigel (1988, p. 1454), Humphreys et al. (2003a) selectively connected some data points on the graph, which create the false impression that a "knee" and "defect line" are present (my Figure 3). Humphreys (2005) never comments on his "interpretation" of the Lippolt and Weigel diagram and how this is another example of how he misrepresents data from the literature. 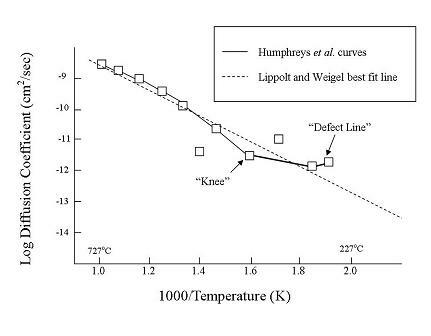 Interestingly, if the Lippolt and Weigel (1988) approach of extending an intrinsic curve to ambient temperatures without defining a defect curve is applied to Humphreys et al. 's data, the extended curve passes very close to the curve of their "uniformitarian" model (my Figure 4). Humphreys et al. (2003a, p. 5) states that defects in zircon crystals are responsible for the existence of defect curves and their locations on Arrhenius plots. The question then arises, what would happen to the defects in any zircons and their defect curves if these minerals were under 200 to 1,200 bars of pressure in the subsurface rather than in a laboratory vacuum? If subsurface pressures begin to close fractures or other defects in the zircons, zircon permeabilities would sharply decline and diffusion would slow down. The defect curve would tend to decline and approach the intrinsic curve and perhaps even the "uniformitarian model." Figure 3: Arrhenius plot of muscovite data from Lippolt and Weigel (1988, p. 1454) and their linear best-fit curve. In their Figure 6b, Humphreys et al. (2003a, p. 7) remove the Lippolt and Weigel best fit line and selectively connect some of the data points, which create false impressions that a "knee" and "defect line" are present. Humphreys (2005) never comments on this diagram and how it demonstrates his inability to properly reproduce data from the literature. Figure 4. This Arrhenius graph shows vacuum results from the 750-meter Fenton Hill zircons (Humphreys et al., 2003a, 2004), which are plotted as gray squares. Vacuum measurements for the 1490-meter zircons (Humphreys et al., 2004) are represented by black diamonds. The graph also shows the "creation model" (open triangles) and "uniformitarian model" (open boxes) of Humphreys et al. (2004). 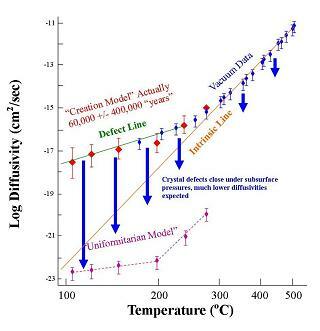 The "creation model" lies along a defect curve resulting from measurements of the 1490-meter zircons. Following the procedures in Lippolt and Weigel (1988), the intrinsic curve of the 750- and 1490-meter data is extended down to low temperatures. The extended intrinsic curve passes very close to sample 1 of the "uniformitarian" model, which may be relevant under relatively high-pressure subsurface conditions. Under high-pressure subsurface conditions, defect lines should be less pronounced and the samples should have lower diffusion coefficients (located lower on the graph). The table in Appendix C of Humphreys et al. (2003a) lists the wrong unit of measure for the helium diffusion results of the zircons from the 750-meter sample. Humphreys (2005) admits that the units should be ncc (nano cubic centimeters) rather than nmol/g. Because of this error, I mistakenly concluded in my original essay that the Q/Q0 values for the 750-meter sample were unrealistically high. After correcting his mistake, Humphreys (2005) chides me for not being skeptical enough of his work. In this case, Dr. Humphreys is right. I should have been more skeptical of how he handles data and I should not have assumed that Dr. Humphreys had checked his work to make sure that the diffusion values in the column added up correctly. Even if the "dating" equations (12-14, 16 and 17) in Humphreys et al. (2003a) were reliable, they would still need accurate and precise measurements of Q0, Q, D at natural pressures, a, and/or b before any of the equations would work. As discussed below, the data in Humphreys et al. (2003a, 2004) are often poorly defined and inaccurate. Most of the results in Humphreys et al. (2003a, 2004) simply fail to meet any acceptable scientific standards. Gentry et al. (1982a) contains helium (Q) measurements of zircons from their Fenton Hill samples 0-6. While Humphreys (2000) simply listed the helium measurements from Gentry et al. (1982a), Humphreys et al. (2003a) in consultation with R. Gentry concluded that these helium measurements had been miscopied into Gentry et al. (1982a) (my Table 1). Their undocumented "corrections" to the measurements in Gentry et al. (1982a) usually included lowering the Q values by 10 times (my Table 1). Table 1: Information on the Fenton Hill, New Mexico, well cores, including original helium concentrations (Q in nano cubic centimeters of helium per microgram of zircon at standard temperature and pressure [STP], ncc STP/μg) from Gentry et al. (1982a, p. 1130) and Humphreys et al. (2004). Samples 0-6 are from Gentry et al. (1982a) and Humphreys et al. (2004) is the source of samples 2002 and 2003. Revised helium (Q) values are from Humphreys et al. (2003a, p. 3). Depths are from Humphreys et al. (2004, Table I, p. 3). Gentry et al. (1982a) identified the surface lithology as the Bandelier Tuff. The other lithologies are from Laughlin et al. (1983). The ratios of measured helium to theoretical radiogenic helium (Q/Q0 values, defined in my Appendix A) are from Humphreys et al. (2003a,b; 2004) and Gentry et al. (1982a). Dr. Humphreys has yet to reveal how these "typographic errors" in Gentry et al. (1982a) were discovered, whether any of the original laboratory notes were consulted to properly correct the errors, and why the errors went publicly unnoticed for about 20 years. As discussed above, there are numerous incidences where Dr. Humphreys has unjustly manipulated (e.g., a graph in Magomedov, 1970) or sloppily handled data (e.g., the units of measure in Appendix C of Humphreys et al., 2003a). Therefore, documenting the validity of the changes to the helium values from Gentry et al. (1982a) is even more urgent. Dr. Humphreys needs to fully explain this issue and dispel any possible thoughts that the data from Gentry et al. (1982a) were altered (like the data in Magomedov, 1970) to comply with his results. Finally, such poor documentation to justify changes in published data would never be tolerated in authentic scientific journals. Any editor or peer-reviewer of a legitimate scientific journal would demand a thorough and complete explanation of why these changes are justified before any revisions would be allowed to appear in their journals. Competent editors and reviewers would also insist that the original laboratory notes be consulted or that the results be discarded and the analyses redone. Using a series of questionable and vague assumptions, Gentry et al. (1982a) derived a single helium retention (Q0) value for their 1-6 samples and used it to calculate helium measured/helium theoretical (Q/Q0) values for the six samples. Humphreys et al. (2003a, 2004) took the high Q/Q0 values from Gentry et al. (1982a), modified the helium measurements (Q) and defined Q0 as 15 ncc STP/μg. Using the available information from Gentry et al. (1982a) and ignoring the possibility of extraneous 4He and 3He, I was unable to derive a Q0 of 15 ncc STP/μg for the zircons. Instead, the assumptions in Gentry et al. (1982a) yield a Q0 of 41 ncc STP/μg (Appendix A). Humphreys (2005) admits that revising the Q0 value from 15 to 41 ncc STP/μg as shown in my Appendix A would reduced his Q/Q0 values by "a factor of two or so." However, he fails to mention that these changes would also more than double his "creation date" of 6,000 years to 13,000 years, which is a little bit too old for the biblical demands of most YECs. "But after discussing the matter with him [R. Gentry], I'm inclined to think that even if he [R. Gentry] had an error in Q0, the error canceled out when he calculated the ratio Q/Q0, which is the crucial quantity in this analysis." "The paper I plan to submit to CRSQ will discuss this issue more fully." "However I did not spell out the details of that calculation, so I plan to do that in the paper I intend to submit to CRSQ soon." Because Humphreys (2005) had no problem performing the necessary calculations and correcting his mistake in Appendix C of Humphreys et al. (2003a), why shouldn't he be able to readily explain why Q0 is less than 41 ncc STP/μg? Why the delay? Why do he and R. Gentry need at least several more months to provide some simple explanations and calculations? Dr. Humphreys either needs to justify the Q0 value of 15 ncc STP/μg under the assumptions in Gentry et al. (1982a) or admit that the approach in Gentry et al. (1982a) is wrong, the Q/Q0 values should be discarded and a better way must be found to estimate Q0 and Q/Q0 values. As further discussed in Appendix A, the dodging and delays in Humphreys (2005) and his willingness to selectively alter the values and assumptions in Gentry et al. (1982a) to protect his high Q/Q0 values and support his agenda do not add any public confidence in his ability to perform science. By just arguing over whether Q0 is 15 ncc STP/μg, 41 ncc STP/μg or something in between, Humphreys (2005) actually misses the real point of my Appendix A. The purpose of Appendix A was simply to show that there are serious errors in the calculations of Gentry et al. (1982a). However, even if Gentry et al. (1982a) and I had obtained the same Q0 value, I would still argue that their approach was flawed from the very beginning and that their Q0 and Q/Q0 values should be discarded. Gentry et al. (1982a) admit that their samples 1-6 came from a variety of rock types, which means that the uranium concentrations in the zircons from these various igneous and metamorphic rocks are likely to be very different. Gentry et al. (1982b) show that the uranium and thorium concentrations of the Fenton Hill zircons are highly variable even within single samples (Table 2; Table B1 in my Appendix B). Therefore, Humphreys et al. (2003a, 2004) and Gentry et al. (1982a) simply cannot justify assigning only one Q0 value (whether 15 or 41 ncc STP/μg) to all of these diverse samples. Statistically valid ranges of Q0 and Q/Q0 values are needed for each sample. Table 2: Revised Q/Q0 values derived by using Q values from Humphreys et al. (2003a) and uranium and thorium data on seven zircons from samples 1, 5 and 6 in Gentry et al. (1982b). The Q/Q0 values for sample 3 were estimated from data in Zartman (1979), which are from a zircon in another nearby sample of the same biotite granodiorite collected at a depth of 2903.8 meters. Detailed calculations are shown in Appendix B. To derive accurate Q0 and Q/Q0 values for their samples, Humphreys et al. somehow need to obtain statistically representative uranium, lead, 3He and 4He analyses on numerous individual zircons from each core sample. Until these accurate values become available, the best available chemical data are in Gentry et al. (1982b) and Zartman (1979). The data in Gentry et al. (1982b) and Zartman (1979) indicate that the Fenton Hill zircons typically contain a lot more uranium and thorium than what Humphreys et al. (2003a, 2004) and Gentry et al. (1982a) realized. The higher concentrations of uranium and thorium show that Humphreys et al. 's Q/Q0 values for samples 1 and 3 are inflated, often by at least an order of magnitude and not just by ± 30% as claimed by Humphreys et al. (2003a) and Gentry et al. (1982a) (see my Appendix B and Table 2). For example, Humphreys et al. (2003a, 2004) claim that the Q/Q0 value of sample #1 from Gentry et al. (1982a) is 0.58. That is, the zircons of sample #1 supposedly still contain 58% of their radiogenic 4He. In contrast, the chemical data from Gentry et al. (1982b) indicate that the Q/Q0 for sample #1 is probably lower, perhaps as low as 0.015 (see my Appendix B and Table 2). As discussed below, these lower Q/Q0 values would ultimately raise Humphreys et al. 's "helium diffusion dates" to well above 6,000 years and, in some cases, into the millions of years. Meanwhile, Humphreys (2005) never comments on the results in my Appendix B and how it has even greater negative impacts on his YEC "model" than the values in my Appendix A. "But after discussing the matter with him [R. Gentry], I'm inclined to think that even if he [R. Gentry] had an error in Q0, the error canceled out when he calculated the ratio Q/Q0, which is the crucial quantity in this analysis. In support of that is the remarkable alignment of the diffusion measurements with the predictions in Figure 2." In this case, the diagram is invoked instead of providing the necessary calculations to justify his Q/Q0 and Q0 values. It's obvious that Dr. Humphreys is overawed by his figure. He somehow believes that his diagram conclusively supports his high Q/Q0 values and a 6,000 year old Earth, no matter what the values of Q and Q0 are. 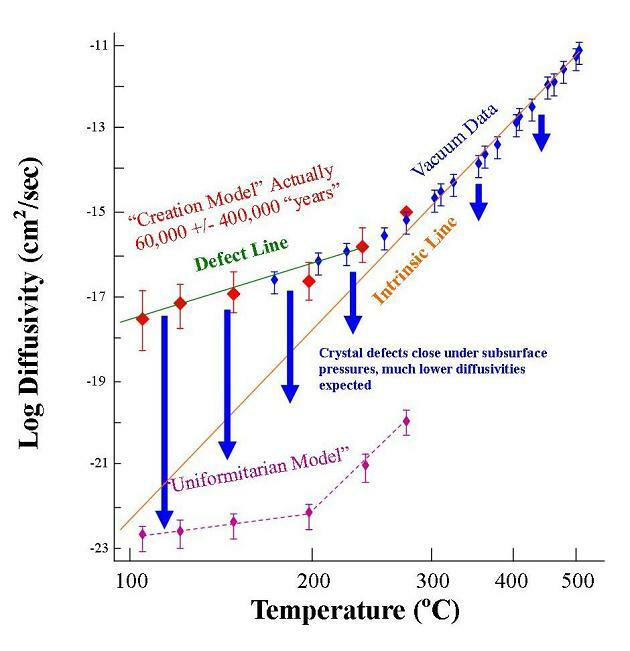 Just because vacuum helium diffusion data for some zircons from one location happen to line up with a curve labeled "6,000 years," Dr. Humphreys assumes that everything that he's done and said in this project must be essentially correct. No one should be awed by Dr. Humphreys' pretty diagram and accept anything he says on faith. As discussed below, a thorough examination of the equations and data in Humphreys et al. (2003a, 2004) shows that his diagram isn't as neat and pretty as Dr. Humphreys believes. Gentry et al. (1982a) does not contain adequate information on the lengths and widths of their zircons. Humphreys et al. (2003a, 2004) also failed to provide suitable measurements of the lengths and widths of the zircons and biotites in their samples. This information is needed to estimate the effective radii of zircons (a) and biotites (b), which are required for the "dating" equations in Humphreys et al. (2003a). In their modeling efforts, Humphreys et al. (2003a, p. 8; their Figure 7) assume that helium diffusion in zircons is isotropic (that is, spherical) and could be represented by a single effective radius, a. Of course, zircons have tetragonal (anisotropic) rather than isotropic crystalline structures, which would cause some anisotropy in the flow of helium through the minerals. Although scientists may assume spherical diffusion in zircons to simplify calculations (e.g., Reiners et al., 2002, p. 300-301), the assumption is not strictly true and could introduce at least minor errors into Humphreys et al. 's "models." Humphreys et al. (2004, p. 15) attempt to minimize the problem by claiming that switching the diffusion geometry of zircons from an isotropic sphere to an anisotropic cylinder would change their results by less than a factor of two. However, as usual, Humphreys et al. (2004) provide no calculations to support this claim. According to Humphreys et al. (2003a, p. 8), Magomedov (1970) defined the a of a zircon crystal as one-half of its length [my emphasis]. Humphreys et al. (2004, p. 7) and Humphreys et al. (2003a, p. 20) adopted this convention for their isotropic helium model. In contrast, Reiners et al. (2004, p. 1859) describe a as the "average half-width of the tetragonal prisms" [my emphasis]. The width of a tetragonal prism may be readily determined by sieving, whereas the lengths cannot. Because zircon crystals tend to be elongated, Dr. Humphreys' a values will be significantly longer than values obtained using the more widely accepted definition in Reiners et al. (2004). Rather than carefully measuring critical factors such as the lengths and widths of their zircons, Humphreys (2005) admits that the sizes of the zircons in his 750-meter (2002) sample were never determined. Instead, he simply assumed that a was 30 microns. Heimlich (1976) performed numerous measurements on zircons from various sections of the Fenton Hill cores. Based on the widths of the zircons in Heimlich (1976), a is probably closer to 20 microns for many of the Fenton Hill samples rather than the 30 microns commonly assumed by Humphreys et al. (see my Appendix B). Estimating a at 30 microns, 20 microns or a similar value may seem trivial. However, similar studies show that poorly defined a values can introduce huge errors in the argon diffusion coefficients of feldspars (McDougall and Harrison, 1999, p. 147-148). Specifically, Mussett (1969) showed that improper estimates of a can cause the argon diffusion coefficients (D values) to vary by over seven orders of magnitude at a given temperature. So, by not properly defining and estimating the a values of their zircons, Humphreys et al. have created additional uncertainties that could seriously impact their helium diffusion values and "dates." The variable b must be known in order to obtain "helium diffusion dates" from equations 12-14 and 17 in Humphreys et al. (2003a). Dr. Humphreys' documents only list one b value, which is an average of ~1000 microns for an unknown number of biotites from the 750-meter (2002) sample \ (Humphreys et al., 2003a, p. 8). In my original essay, I criticized Humphreys et al. (2003a, p. 8) for failing to indicate how many grains were measured to obtain this average, providing no standard deviations for this value, and then erroneously applying this one average to all of the other samples from the Fenton Hill cores (that is, 1-6 and 2003; Table 1). Because descriptions in Laughlin et al. (1983) indicate that samples 1-6 in Gentry et al. (1982a) and samples 2002 and 2003 from Humphreys et al. (2003a, 2004) were from diverse metamorphic and igneous rocks (my Table 1), it's likely that the sizes, and therefore the b values, of the biotites from these different rocks are very dissimilar. Rather than providing suitable measurements and standard deviations for b, Humphreys (2005) again throws out the same old lame excuses. He tries to belittle his mistakes by claiming that accurate b values really aren't important because the biotites supposedly only have minor effects on his results. However, as shown in Table 3 below, the size of b has a profound effect on the "dates" from at least equation 17 of Humphreys et al. (2003a). Furthermore, Dr. Humphreys fails to remember that his single b value played a key role in his efforts to remove sample 6 from his "models" and obtain his desired "helium diffusion date" of 6,000 years (see discussions below). Even if accurate b values were not very important to his "dating" efforts, Dr. Humphreys' neglecting to provide valid averages and standard deviations for any of his data is not a trivial issue. His lack of suitable averages and standard deviations (whether for his a or b values) exposes serious shortcomings in his data-handling procedures. "However, Henke has the raw data we published, so he can compute the standard deviations for himself." I need to remind Dr. Humphreys that his papers only contain one average b value (p. 8, Humphreys et al., 2003a). Contrary to the claims in Humphreys (2005), the necessary raw data to calculate a standard deviation for b are not present in any of his documents. How can anyone obtain a standard deviation from only one number?! Where are these raw data, Dr. Humphreys? DR. HUMPHREYS, AS I TOLD YOU BEFORE, WE CAN'T ACCEPT YOUR ACT OF "GENEROUSITY"
Harrison et al. (1986) and Sasada (1989) clearly refute another major assumption in Humphreys et al. (2003a, p. 8), which states that subsurface temperatures at Fenton Hill have been constant over time. Using 40Ar/39Ar dates from feldspars at depths of 1130, 2620, and 2900 meters in the Fenton Hill core samples, Harrison et al. (1986, p. 1899, 1901) concluded that the temperatures for these samples fell below approximately 200°C about 1030 million years ago and below about 130°C around 870 million years ago. Harrison et al. (1986, p. 1899) also identified a noticeable thermal event in the Fenton Hill core samples within the past few tens of thousands of years. "The fluid inclusions in the calcite veins and those in quartz of the Precambrian crystalline rocks from the GT-2 indicate heating up to the thermal maximum, cooling and calcite veining, and heating again to the present temperature." In response to the overwhelming evidence of a variable thermal history for the Precambrian Fenton Hill cores (Sasada, 1989; Harrison et al., 1986; etc. ), Humphreys et al. (2003a, p.10; 2004, p. 8) indicate that they assumed constant temperatures over time to simplify their calculations and to be "generous" to the "uniformitarians." According to Humphreys et al. (2003a, p.10; 2004, p. 8), without constant temperatures, the "uniformitarian model" would be even worse. Figure 5. Thermal history of a granodiorite at 2624 meters depth (Fenton Hill cores) and hypothetical relationships with extraneous helium (based on Figure 9 in Sasada, 1989). 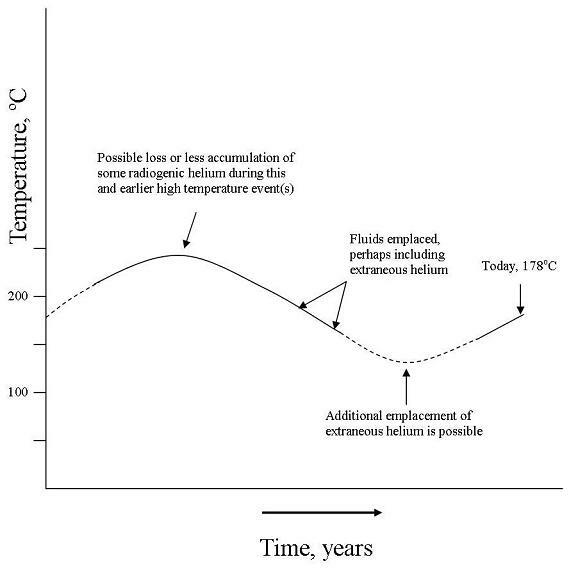 Humphreys (2005) ignores the consequences of the thermal and fluid history in this diagram to his "models." "Henke is counting on his readers not to have read my papers carefully enough to know that I considered and discussed all the factors he mentions. I pointed out [ICC 2003, section 7] that, 'Our assumption of constant temperatures is generous to uniformitarians.'" Humphreys (2005) fails to realize that accuracy is always more important than adopting obviously false assumptions just to be "generous" to your opponents. As I stated in my original essay that Humphreys (2005) ignored and that he is counting on his readers not to have read, scientists don't need or want any erroneous "acts of generosity" from him or anyone else. If a problem exists, scientists must deal with it realistically. Until Dr. Humphreys and his YEC colleagues can provide better evidence, they have no rational grounds for generating inaccurate data based on false assumptions and then quoting their Bibles and invoking "god-of-the-gaps" to explain away the history of these zircons. Meanwhile, contrary to Dr. Humphreys' constant ducking from criticism and failing to carefully read and understand the works of his critics, my constant linking and referencing of his documents refutes Dr. Humphreys' (2005) contention that I don't want my readers to see his incriminating statements for themselves. Throughout his Fenton Hill documents, Dr. Humphreys talks about the "uniformitarian model" requiring helium retention in zircons for 1.5 billion years. Under subsurface pressures, the zircons might easily retain much of their helium for 1.5 billion years. However, if the zircons have been largely contaminated with extraneous ("excess") 3He and 4He (see analogous definitions for excess and extraneous argon in McDougall and Harrison, 1999, p. 11), then the "uniformitarian" model does not require a time span of 1.5 billion years. Indeed, one of several possible explanations for the Humphreys et al. data that don't involve YEC magic is that their results may be nothing more than artifacts of extraneous helium contamination that occurred many thousands or tens of thousands of years ago. Why Don't YECs Accept the Possibility of Extraneous Helium? YECs readily accept the existence of extraneous argon because they improperly believe (see response here) that "undetected excess" argon nullifies K-Ar and Ar-Ar dating. Because helium atoms are much smaller than argon atoms, helium would tend to more readily move in and out of most minerals than argon. So, if YECs enthusiastically accept the existence of extraneous argon, why shouldn't they acknowledge that subsurface minerals (including zircons) could be substantially contaminated with extraneous helium? "A second uniformitarian line of defense might be to claim that the helium 4 concentration in the biotite or surrounding rock is presently about the same as it is in the zircons. (Such a scenario would be very unusual, because the major source of 4He is U or Th series radioactivity in zircons or a few other minerals like titanite or apatite, but not biotite.) The scenario would mean that essentially no diffusion into or out of the zircons is taking place. However, our measurements (Appendix B) show that except for possibly samples 5 and 6, the concentration of helium in the biotite [sect. 6, between eqs. (7) and (8)] is much lower than in the zircons. Diffusion always flows from greater to lesser concentrations. Thus helium must be diffusing out of the zircons and into the surrounding biotite." "First, if the helium in the zircons were 'excess' and came from outside them, it would have had to come through the biotite. As I pointed out on p. 9 of CRSQ 2004, the helium concentration in the biotite is two hundred times lower than the concentration in the zircon. That means, according to the laws of diffusion, that the helium is presently leaking out of the zircons into the biotite, not the other way around. Also, as I pointed out, the total amount of helium in the biotite is roughly the same as the helium lost from the zircon." Obviously, Dr. Humphreys has an invalid Lyell uniformitarian mindset that YECs so often accuse scientists of possessing. That is, Dr. Humphreys falsely believe that if the helium concentrations in "surrounding" biotites are now relatively low, then these concentrations must have always been low. Dr. Humphreys simply fails to realize that the zircons may have been contaminated with extraneous helium many thousands of years ago. Again, Sasada (1989) argues that the Fenton Hill rocks were mineralized by fluids during a relatively cool period in the recent past (my Figure 5). During prolonged exposure, extraneous helium could have contaminated biotites, zircons and other minerals. Also rather than always penetrating the zircons, helium pressures surrounding the minerals may have been periodically high enough in the past to temporarily prevent or extensively slow down the escape of any helium from the zircons. According to Sasada (1989), the cooling event in the subsurface of Fenton Hill was followed by reheating to present temperatures (my Figure 5). During this current reheating event, the cleavage planes in biotites and other micas would provide excellent pathways for their extraneous helium to largely dissipate as background helium concentrations in the regional crust declined. However, the relatively impermeable zircons could have retained any extraneous helium for a longer period of time, perhaps up to the present. Therefore, instead of observing the substantial remnants of radiogenic helium in zircons from 1.5 billion years' worth of uranium and thorium decay, Humphreys et al. (2003a,b; 2004) might be largely analyzing remaining extraneous helium that contaminated the Fenton Hill subsurface rocks during the relative cool period in the recent past. If extraneous helium is present in the Fenton Hill zircons, at least 3He might be identified and appropriate corrections could be made. Furthermore, there are techniques for identifying extraneous ("excess") argon (Hanes, 1991; McDougall and Harrison, 1999, p. 114-130) and analogous methods might be able to identify extraneous 4He. For example, quartz and other impermeable and low-uranium minerals should be analyzed for extraneous helium. If extraneous helium occurs in quartz, it's probably also present in adjacent zircons. So, before Dr. Humphreys can use his "studies" to promote a religious agenda, he clearly needs to measure the 3He and 4He values of fresh (not >30 years old) minerals and eliminate any possible effects from extraneous helium. Humphreys (2005) also improperly believes that it's unlikely that fluids flowed through the rocks of the Fenton Hill cores in the past because they're currently "dry and well-consolidated." Once again, Dr. Humphreys shows his fallacious Lyell uniformitarian thinking (that is, because the rocks are now dry and impermeable, they must always have been dry and impermeable in the past). However, if fluids did not migrate through the Fenton Hill cores sometime in the past, why are their fractures often filled with secondary minerals (for example, Sasada, 1989)? How did these hydrothermal (hot water) secondary minerals form under dry conditions? Also, why have the cores been substantially altered by fluids (Laney et al., 1981; Laughlin and Eddy, 1977, p. 28)? How does the presence of fluid-altered grains support the undocumented proclamation in Humphreys (2005) that fluids could not have traveled very far in the Fenton Hill Precambrian rocks because "the interface widths between minerals would be microscopic, perhaps only an Angstrom (the diameter of a hydrogen atom) or so"? Where's the evidence of these no more than Angstrom wide interface widths and, even if they existed, why couldn't the fluids pass through fractures in the grains rather than only in the interface spaces between grains? Why is uranium enriched in sealed fractures in the biotite granodiorite of the GT-2 core (West and Laughlin, 1976, p. 618)? On the basis of the extensive alterations in the Fenton Hill core, Dr. Humphreys must recognize that these rocks were once far more permeable than he realizes. Furthermore, because the core has been contaminated with uranium, we should expect the decay of this uranium to produce significant extraneous 4He that could contaminate zircons and other minerals. "Derived from some other source" would mean extraneous helium or possibly interferences from their analytical equipment. Zircons from the biotite granodiorite (Zartman, 1979) and overlying gneisses in the Fenton Hill core (Appendix A in Humphreys et al., 2003a) have discordant U/Pb dates, which indicate open system behavior for lead and/or uranium, and no doubt helium. Open systems not only mean that helium may periodically flow out of zircons, but if the helium pressures surrounding the minerals were once higher, extraneous helium could have periodically flowed into them. To enter a zircon, extraneous helium need not actually dissolve into the zircon crystalline structure or migrate across the boundary (interface) between a biotite and zircon crystal. The helium could have entered and become trapped in small fractures, permeable metamict areas and other voids in the zircons. Humphreys (2005) also mistakenly believes that any helium contamination of zircons would require high temperature "magmatic fluids" and in particular "basaltic magmatic fluids." Volcanism and tectonic activity may cause both 3He and 4He to rise from the Earth's interior, mix, accumulate in minerals in the upper crust, and then perhaps eventually escape into the atmosphere (also see Baxter, 2003). Again, Humphreys (2005) wouldn't be making these statements if he had bothered to read my original essay and the relevant literature about the uranium-bearing fractures and abundant fluid-altered minerals in the cores. While magmas can certainly release extraneous helium, 3He and 4He may also originate from the massive portions of the mantle that are not molten (Goff and Gardner, 1994, p. 1816). Extraneous helium may further accumulate in hydrothermal (not magmatic) fluids through the leaching of 4He from surrounding Precambrian rocks (Truesdell and Janik, 1986, p. 1827). These fluids need not be close to magmatic temperatures (650°C and higher). For example, helium-bearing fluids currently in the nearby Valles Caldera are only 260-295°C (Goff and Gardner, 1994, p. 1816). The Baca geothermal test wells are located in the Valles Caldera, only a few kilometers away from the Fenton Hill site. Fluid samples collected from the wells in the 1980s contained significant extraneous helium. In 1982, extraneous 4He ranged from 0.0183 cc/kg for Baca-15 to 0.1173 cc/kg for Baca-4 (or 0.0183 to 0.1173 ncc STP/μg) (Smith and Kennedy, 1985, p. 897). According to Goff and Gardner (1994, p. 1816), wells Baca-15 and Baca-4 are greater than 1,000 meters deep and have bottom temperatures of 267°C and 295°C, respectively. In a later article, Truesdell and Janik (1986, their Table 8, p. 1831) report somewhat higher helium concentrations (about 0.2 ncc STP/μg) in Baca wells 13 and 4. The helium concentrations in at least the Baca 4 well approached or exceeded the helium concentrations that Humphreys et al. (2003a) list for the zircons in samples 4-6 (my Table 1). Unless Humphreys et al. can thoroughly identify and subtract out any extraneous background helium, no one should expect realistic results from their "creation" and "uniformitarian models." For example, the extremely small Q/Q0 values predicted by the "uniformitarian model" in Table 5 of Humphreys et al. (2003a, p. 12) could be easily masked by extraneous helium concentrations of only 0.01 ncc STP/μg. "Henke's scenario is pure conjecture. It depends on unknown factors to produce improbable coincidences. Even though this is his best shot (that's why I've spent some time on it), it falls far short of credibility." Instead of prematurely rejecting my hypothesis, perhaps Dr. Humphreys should explain how the fractures in the Fenton Hill cores filled with minerals, especially uranium-bearing minerals? Or maybe Dr. Humphreys wants to explain away these minerals with miracles too. So, Dr. Humphreys, I would argue that your miraculous accelerated decay scenario is pure conjecture. It depends on unknown factors; that is, groundless miracles. Even though this is your best shot (that's why I've spent some time on it), your reliance on magic falls far short of credibility. Considering the current presence of extraneous helium in the nearby Valles Caldera, past contamination of the Fenton Hill zircons with extraneous helium is certainly not an outrageous hypothesis. It certainly makes more sense than invoking religious miracles to accelerate radioactive decay rates and then relying on even more groundless magic to keep the Earth from melting. Humphreys (2005) inaccurately claims that if I want to demonstrate the presence of extraneous helium in the Fenton Hill cores, I need to find "geological evidence that conduits of basalt (solidified volcanic magma) presently exist within that distance of the borehole." Of course, these field studies are completely unnecessary. As explained above, extraneous helium can originate from a number of sources and not just mafic or other magmas. Secondly, even if these studies were to locate evidence of extraneous helium like what was found a few kilometers away in the Valles Caldera (Goff and Gardner, 1994, p. 1816; Smith and Kennedy, 1985; Truesdell and Janik, 1986), Dr. Humphreys would probably invoke some excuses or miracles to reject the evidence. Instead of proposing superfluous field work, Dr. Humphreys should have listened to the advice in my original essay and simply analyzed his zircons for 3He and surrounding low-uranium quartz grains for 4He. These analyses could quickly determine whether his samples contain extraneous helium. To develop and promote their "creation model," Humphreys et al. must explain the helium distributions in the Fenton Hill core samples and also demonstrate that helium diffusion in the zircons under actual subsurface conditions is only consistent with a 6,000 year-old time span. While reviewing their data, Humphreys et al. readily noticed that the Q and Q/Q0 values of samples 1-5 seem to consistently decrease with depth and increasing subsurface temperatures. Humphreys et al. (2003a, p. 3) recognized that the helium concentration (~2 × 10-11 cc STP/μg) in sample 5 "agrees" with the temperature and helium concentration "trends" in samples 1-4, but that an identical helium measurement from sample 6 is "too high" to fit their "model." To validate their "creation model," Humphreys et al. (2003a, p. 3, 8) must demonstrate that the Q and Q/Q0 values for sample 5 are trustworthy and should be included in their "models." At the same time, Humphreys et al. must think of some excuse to treat the identical results from sample 6 as a "special case" (Humphreys et al., 2003a, p. 3) and somehow eliminate them from the "modeling" efforts. Although Humphreys et al. (2003a, p. 3) claim that they will "allow for the possibility" that the error on the helium measurement of sample 5 is considerably larger than the errors of samples 1-4, their Table 1 lists no error for the Q/Q0 value of sample 5 and they generally treat the helium concentration of the sample in a quantitative manner in their "models" (as examples, Tables 4 and 5 in Humphreys et al., 2003a, p. 12). Although Humphreys et al. (2004, p. 8) places an approximation sign next to the "date" for sample 5 in Table III, the "date" still espouses at least three significant digits. The semiquantitative (at best) nature of the helium (Q) results for samples 5 and 6 must be remembered when evaluating Humphreys et al. 's helium diffusion "dates." Rather than treating both samples 5 and 6 as contamination during analysis, unreliable instrument noise, minor helium background concentrations, or in another consistent manner, Humphreys et al. (2003a) attempt to justify eliminating sample 6 from their "models." At the same time, they fail to apply the same standards to sample 5. "Because b is more than 32 times larger than a, the disk-like (not spherical) volume of biotite the helium enters is more than 1000 (~32 squared [sic]) times the volume of the zircon. This consideration affects the boundary conditions we choose for r = b, and how we might interpret sample 6 (see sect. 2), as follows. [new paragraph] Suppose that helium could not escape the biotite at all. Then as diffusion proceeds, C would decrease in the zircon and increase in the biotite, until the concentration was the same throughout the two materials. After that C would remain essentially constant, at about 0.001 C0. The fraction Q/Q0 remaining in the zircon would be about 0.001, which is just what Gentry observed in sample 6." First of all, what is meant by "disk-like volume"? How can Humphreys et al. (2003a, p. 8) say: "...the disk-like (not spherical) volume of biotite the helium enters is more than 1000 (~32 squared) times the volume of the zircon, [my emphasis]" when volumes have three dimensions and not two? (That is, cubed and not squared dimensions.) If Humphreys et al. are trying to compare a and b by passing a random plane through the center of a zircon and into its surrounding biotite, how can C ~ 0.001 C0 because in the real world the plane would probably intersect several other zircons that are additional sources of helium? Perhaps, Humphreys et al. are suggesting in their statements that all of the helium diffusing out of a sample 6 zircon enters into only one apparently two-dimensional "disk-like" biotite cleavage plane. If so, the volume of this plane is not 1000 times the volume of Humphreys et al. 's spherical zircon with a = 30 microns. The volume of their spherical zircon = 4/3πa3 = 4/3 (3.141) 303 = 113,000 cubic microns. The typical width [h] of a biotite cleavage plane is about 3.4 Å [0.00034 microns](Bailey, 1984, p. 20-23). The volume of that plane would only be 1070 cubic microns (V = πb2h = 3.141 2 [0.00034] = 1070 cubic microns). Therefore, Vbiotite / Vzircon = 0.0095 and not 1000. So, the vague arguments about "two-dimensional" volumes in Humphreys et al. (2003a, p. 8) do absolutely nothing to support their efforts to dispose of sample 6. "Our measurements (see Appendix B [in Humphreys et al., 2003a]) showed that the helium concentration in the Jemez [sic, gneiss] biotite at a depth of 750 meters was small, only about 0.32 × 10‑9 cm3 (at STP) per microgram. Taking into account the difference in density of biotite and zircon (3.2 g/cm 3 and 4.7 g/cm3), that corresponds to almost exactly the same amount of helium per unit volume as sample 6 contained. That suggests the zircon and biotite were near equilibrium in sample 6, thus supporting our hypothesis." In the above statements, Humphreys et al. (2003a, p. 8) noticed similarities between the helium concentration of impure and ground biotites (Appendix B in Humphreys et al., 2003a, p. 19) from a gneiss collected at a depth of 750 meters and their revised helium concentration for the zircons from sample 6 (a different gneiss with granodiorite intrusions at 4310 meters depth, Laughlin et al., 1983). They then illogically concluded that the biotites from sample 6 must have the same helium concentration as the biotites from the 750-meter sample. Certainly, the helium concentrations of the zircons and biotites in both samples 5 and 6 may be in equilibrium with extraneous background helium; however, how can anyone argue that the helium concentrations of the zircons and biotites in sample 6 are essentially the same on the basis of comparing the amount of helium in the sample 6 zircons with the helium concentration of an impure biotite sample from a different gneiss at only 750-meters depth? Again, this approach contradicts the admission in Humphreys et al. (2003a, p. 6) that mixing measurements from different lithologies is inappropriate. Dr. Humphreys needs to actually measure the helium concentration in the sample 6 biotites to confirm that they are not even lower. Rather than deal with the irrational statements in Humphreys et al. (2003a), Humphreys (2005) simply refers to the same erroneous sections of Humphreys et al. (2003a) and once again appeals to his deceptive Figure 2. Despite a couple of erroneous attempts, Humphreys et al. (2003a) have not shown that the Q and Q/Q0 values for sample 6 should be treated any differently than the results for sample 5. Contrary to the approximations in Gentry et al. (1982a) and even statements by Humphreys et al. (2003a, p. 3) that they will "allow for the possibility" that the error on the helium measurement of sample 5 is considerably larger than the errors of samples 1-4, Dr. Humphreys has failed to show that the Q and Q/Q0 values for sample 5 are quantitative enough to justify their use in his "creation" and "uniformitarian models." "However, we could dispense with both samples [i.e., samples 5 and 6] entirely with no damage to our case at all. This is just another quibble about an inconsequential issue." However, the mathematics refute Dr. Humphreys' superficial claims. Without sample 5, the dating scheme in Table III of Humphreys et al. (2004, p. 8) would only consist of samples 2, 3, and 4 (dates of 7270, 2400, and 5730 years). This small dataset would provide an outlandish average "date" of 5,100 ± 5,000 years (2-sigma using the non-biased equation, Davis,1986, p. 33; Keppel, 1991, p. 43-44, 58). In other words, at 95% confidence and without sample 5, Dr. Humphreys' "date" for the Fenton Hill zircons is worthless even by YEC standards and now spans two orders of magnitude: anywhere from 100 to about 10,000 years. The dire consequences of removing just one sample from his dataset shows how weak Dr. Humphreys' claims really are. In Humphreys et al. (2004, Table III, p. 8), the "dates" for samples 2-5 (i.e., 7270, 2400, 5730 and ~7330 years) were averaged. Humphreys et al. (2004) rounded off the average value of 5,681 years to 6,000 years. Humphreys et al. (2004) then list the "date" and "standard deviation" for their "creation model" as 6,000 ± 2,000 years. Typically, standard deviations are calculated with a "non-biased" equation, which uses degrees of freedom (n-1) in the denominator rather than the total number of samples (n) (Davis, 1986, p. 33; Keppel, 1991, p. 43-44, 58). Furthermore, the errors are often given as two standard deviations, which are large enough to include 95% of all theoretical measurements. Such an approach would yield 6,000 ± 4,600 years for the results in Table III of Humphreys et al. (2004, p. 8) (not ± 4,000 years as stated in Humphreys, 2005). Instead of utilizing the traditional approach, Humphreys et al. (2004, Table III, p. 8) minimized their standard deviation at ± 2,000 years by using the "biased" equation (n instead of n-1 in the denominator) and only reporting one standard deviation (about 68% of the measurements). This is an old statistical trick that some individuals use to make their errors appear as small as possible. Obviously, Humphreys et al. (2004) would rather have their method provide a most recent "creation date" of 2,000 BC instead of 600 AD! Humphreys (2005) mentions that he simply prefers to use one standard deviation rather than two. Certainly, scientists sometimes only use one standard deviation. However, Humphreys (2005) never justifies his use of the unconventional "biased" equation to calculate his standard deviations. Using activation energy and diffusion coefficients from Magomedov (1970) (which are listed in footnote 16 of Gentry et al., 1982b), Humphreys et al. (2004, p. 10) performed some calculations and claimed that 60-micron long zircons (assuming a = 30 microns) from sample 6 should lose about 50% of their lead if they were exposed to 313°C for 1.5 billion years. Because the zircons supposedly have only lost about 10% of their lead (Humphreys et al., 2004, p. 9), Humphreys et al. (2004, p. 10) spuriously argue that the zircons must be much younger than 1.5 billion years old. Lee et al. (1997, p. 160, 161) list a more recent activation energy value (161 kcal/mol) and temperature-independent diffusion coefficient (approximately 3.9 × 109 cm2/sec) for lead in a gem-quality Sri Lankan zircon. The Lee et al. diffusion coefficient is 11 orders of magnitude (!) larger than the measurement in Magomedov (1970), which was obtained on exceptionally metamict (altered) zircons. Inserting the values from Lee et al. (1997) into the same equation used by Humphreys et al. (2004, p. 9-10) (that is, Nicolaysen, 1957 in footnote 16 of Gentry et al., 1982b, p. 298) predicts only about 1% lead loss at 313°C over 1.5 billion years rather than a loss of approximately 50% as claimed by Humphreys et al. (2004, p. 10). Entering data from another lead diffusion in zircon study (Cherniak and Watson, 2000) into the Nicolaysen equation also predicts about 1% lead loss in the zircons over 1.5 billion years. A 10% actual lead loss in the sample 6 zircons could be easily explained by metamorphic fluids leaching lead from metamict portions of the zircons (Geisler et al., 2002) and/or prolonged exposure to temperatures well above 313°C sometime in the distant past. Rather than deal with reasonable possibilities, Humphreys et al. (2004) used outdated measurements and made fallacious assumptions, which cause them to erroneously conclude that the lead data are incompatible with an ancient age for the zircons. One must wonder how future studies might change their views of helium diffusion in zircon, especially studies that are done at realistic pressures rather than under a vacuum. Although zircons in the Fenton Hill core may have lost some lead, typically Pb-Pb dates are unaffected (Ludwig et al., 1984; Faure, 1998, p. 288). The masses of the lead isotopes are so similar (204, 206, 207 and 208 amu) that loss events would not be able to remove more of one lead isotope than another. Humphreys (2005) refers to the "dates" in Tables 5 and 6 of my original essay as garbage in, garbage out. I must agree and I indicated that in my original essay. Considering the faulty equations and assumptions in Dr. Humphreys' project, I don't think that any reliable helium diffusion dates are possible with his approach. Nevertheless, if Dr. Humphreys doesn't like the "dates" in my tables, he needs to realize that they were derived from his equations, his incorrect units of measure in Appendix C of Humphreys et al. (2003a), corrections to his Q/Q0 values based on data from YEC Gentry (Gentry et al., 1982b), and more realistic ranges for his a and b values. Even after removing the effects of Dr. Humphreys' Appendix C error, deriving better estimates of a, and only using the better Q/Q0 values from my Appendix B, Dr. Humphreys' "dating" equations still don't produce results that support his religious agenda (see Table 3 below). Because of the errors in Appendix C of Humphreys et al. (2003a), I recalculated the helium diffusion "dates" using equations 12-14, 16 and 17 from Humphreys et al. (2003a). In my calculations, the helium diffusion coefficients (D) for samples 3 and 5 were taken from measurements in Table III of Humphreys et al. (2004, p. 8). The D values for samples 1 and 6 were estimated from Table II of Humphreys et al. (2004, p. 6) based on temperatures from Table I (p. 3) of the same document. The x values for equation 17 were taken from Table 2 in Humphreys et al. (2003a, p. 10). As discussed above, Humphreys et al. (2003a, 2004) failed to properly estimate their a values and never provided any suitable standard deviations. Based on the descriptions in Humphreys et al. (2003a, 2004), Gentry et al. (1982a), and numerous measurements of Fenton Hill zircons in Heimlich (1976) (see my Appendix B), the best estimates of a for any 50-75 microns long zircons in samples 1-6, 2002 and 2003 are probably around 0.002-0.003 cm. Because no standard deviations are given for the b value in Humphreys et al. (2003a, p. 8) and because the sizes of the biotite grains (b values) in the igneous and metamorphic rocks of the Fenton Hill cores could be radically different than the single average measurement provided by Humphreys et al., alternative b values of 0.05 cm and 0.30 cm were also used in the equations. In my calculations with equation 14a-c, the a values were paired with b values in such a way as to obtain a maximum range of possible "dates." As discussed earlier and as shown in my Appendix B, the Q/Q0 values in Gentry et al. (1982a) and Humphreys et al. (2003a, 2004) are unreliable. Considering the invalidity of the assumptions in Gentry et al. (1982a), I do not think that even the corrected Q/Q0 values in my Appendix A are good enough to use. Appendix B lists the best available values, which only include samples 1, 3, 5, and 6. If Humphreys (2005) really believes that "it does not matter in the least to our results whether we call the low-temperature part of the curve a 'defect line' or not" and that my criticisms are a "ridiculous quibble," then he should be willing to allow the results for sample 1 to be entered into his equations. As discussed above, if Dr. Humphreys is willing to derive "dates" for sample 5, he has no justification for objecting to any "dates" from sample 6. My resulting "dates" with samples 1, 3, 5 and 6 are listed in Table 3. The average of all of the "dates" in Table 3 is a ridiculous 60,000 ± 400,000 "years" old (one significant digit with two standard deviations) with a range of 100 to 1,300,000 "years" old. Considering the absurd range of "dates" using Dr. Humphreys' methods, YECs have no basis for criticizing the relatively minor problems with radiometric dating. Table 3. "Dates" for Fenton Hill zircons 1, 3, 5 and 6 (my Table 1) derived from equations in Humphreys et al. (2003a, p. 9-11). "Dates" for samples 1 and 3 have two significant digits. Because Gentry et al. (1982a) could only approximate the helium measurements (Q) for the zircons of samples 5 and 6, the Q/Q0 values and resulting "dates" for these samples are even less certain and their "dates" only have one significant digit. See text for other details. "Finally, if I used such poor judgment in choosing the simplifying assumptions for my "6,000 year" model, how did it happen to anticipate the data in Figure 2 so exactly?" My Figure 6 shows the vacuum diffusion data from Humphreys et al. (2003a, 2004). Notice that there is nothing in this Arrhenius plot that provides a date for the Fenton Hill zircons. The only measured dates for the Humphreys et al. zircons are the ancient U/Pb results in Appendix A of Humphreys et al. (2003a). Dr. Humphreys' 6,000 year old "date" solely came from his "creation model," which is based on Q/Q0 values that are often too high, helium diffusion measurements (D values) that probably don't represent high-pressure conditions in the subsurface of Fenton Hill, a and b values that are based on missing or inappropriate measurements, and many other invalid assumptions and results that have been previously discussed. Just because Dr. Humphreys can draw a pretty diagram and attach the number 6,000 to it that does not mean that the diagram says anything worthwhile. To paraphrase Dr. Humphreys, Figure 2 in Humphreys (2005) is garbage in, garbage out. Figure 6. An Arrhenius plot of the vacuum helium diffusion measurements from Humphreys et al. (2003a, 2004). Notice that these data do not provide an age for the zircons. "This sequence of events places the burden of disproof on the critics, because they must explain how, if there is no truth to our model, the data 'accidentally by sheer coincidence just happened by blind chance' to fall right on the predictions of our model." As shown in my Figure 7 and Table 3, Humphreys (2005) fails to realize that by using bad assumptions and unreliable measurements for a, b, and Q/Q0, anyone could use his equations to get "creation dates" of any value from hundreds to at least millions of years. If the helium diffusion measurements had been done under pressures that modeled the subsurface conditions at Fenton Hill, it's doubtful that the experimental data would have continued to line up with Dr. Humphreys' "creation model." Considering the trends with noble gases in other silicate minerals (see discussions above), the data might even correspond to the "uniformitarian model." Figure 7. What Dr. Humphreys' data really say. Using the best available data, the "creation dates" from the equations in Humphreys et al. (2003a) provide ridiculous answers that range from hundred to millions of "years" (an average and two standard deviations of 60,000 ± 400,000 "years" old, using only one significant digit). Because Dr. Humphreys' helium diffusion data were obtained under a vacuum rather than under pressures that realistically model the subsurface conditions at Fenton Hill, the actual helium diffusion results at Fenton Hill are probably orders of magnitude lower as illustrated by the blue arrows. The graph also shows a linear extrapolation of the intrinsic curve, which is based on procedures in Lippolt and Weigel (1988). 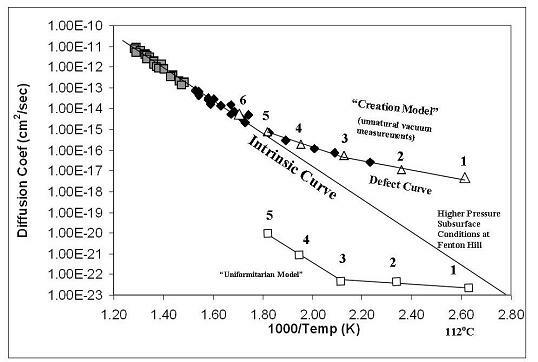 At about 100°C, the intrinsic curve passes very close to the "uniformitarian model." Depending on whether extraneous helium is present in the zircons, the "dates" of the "uniformitarian model" may range from less than 10,000 years to 1.6 billion years. Several other topics are briefly mentioned in Humphreys et al. (2003a). Like their other discussions, Humphreys et al. make a number of statements that are based on questionable claims and outright errors. Humphreys (2005) either ignores my criticisms of his earlier claims or replies with further logical fallacies and scientifically and historically inaccurate claims. Some of these topics are discussed below. Humphreys et al. (2003a, p. 2) briefly discuss the YEC atmospheric helium argument. For years, Vardiman (1990), Melvin Cook (see Cook, 1957) and other YECs have argued that the Earth's atmosphere has too little helium to be billions of years old. However, a review of Vardiman (1990) and other YEC documents show that their arguments are largely based on selective quoting of outdated references from the 1960s and 1970s. Dalrymple (1984, p. 112) concisely challenged many of the YEC atmospheric helium arguments. He showed that YECs often omitted critical details on various atmospheric helium escape mechanisms, such photoionization. YECs also tended to forget about the impacts of 20th century helium pollution on any attempts to evaluate atmospheric escape mechanisms. For many YECs, Vardiman (1990) was the authoritative YEC document on atmospheric helium "dating." Even though Vardiman (1990) was written six years after Dalrymple's report, significant portions of this 1990 document simply repeated old YEC arguments that had been refuted earlier by Dalrymple. For example, carefully compare the statements in Dalrymple, 1984 (p. 112) with Vardiman (1990, p. 24-25). More recent studies (such as LieSvendsen and Rees, 1996; Shizgal and Arkos, 1996) provide additional information on helium escape mechanisms, which further undermined YEC arguments on this issue. Nevertheless, the final nail in the coffin of the YEC atmospheric helium argument occurred when NASA satellite images showed helium and other gases being swept from the Earth's atmosphere into deep space. One event occurred on September 24-25, 1998 after a solar coronal mass emission (see Solar Wind Blows Some of the Earth's Atmosphere into Space and Solar Wind Squeezes Some of the Earth's Atmosphere into Space). "For several years before the magnitude of the polar wind was determined Vardiman (1990) reported that the lack of helium in the atmosphere argued for a young earth. That argument is no longer valid based on the measured and computed escape rate of helium to space in the polar wind." Vardiman (1990, p. 28-29) also correctly states that YECs should study the atmospheric residence times of heavier gases, like argon, which are less likely to escape into space. However, it is doubtful that such studies would support their Genesis agenda. When compared with 36Ar, the Earth's atmosphere has excess 40Ar (Faure, 1986, p. 66), which is compatible with billions of years of 40K decay in terrestrial rocks (Dalrymple, 1984, p. 83; also see Tolstikhin and Marty, 1998). In contrast, stellar atmospheres have more 36Ar than 40Ar (Krauskopf and Bird, 1995, p. 576), which is consistent with stellar evolution (Faure, 1998, p. 18). "3:3 Knowing this first, that there shall come in the last days scoffers, walking after their own lusts, 3:4 And saying, Where is the promise of his coming? for since the fathers fell asleep, all things continue as they were from the beginning of the creation. 3:5 For this they willingly are ignorant of, that by the word of God the heavens were of old, and the earth standing out of the water and in the water: 3:6 Whereby the world that then was, being overflowed with water, perished: 3:7 But the heavens and the earth, which are now, by the same word are kept in store, reserved unto fire against the day of judgment and perdition of ungodly men." YECs feel that this is a "prophecy" against "uniformitarianism." Not surprisingly, Humphreys et al. (2003a, p. 4) follow the YEC crowd and also cite 2 Peter 3:4,5-6 as part of their discussions. In reality, 2 Peter is probably a 2nd century forgery written in response to non-Christian critics attacks on Second Coming of Christ being "soon" (e.g., Revelation 1:3). "The allergy shows itself in his strong objection (just before his conclusion) to my citation of 2 Peter 3:3-7 as a prophecy condemning uniformitarianism. The medication he takes for that malady is (foolishly) to swallow the claim of theologically liberal 'higher critics' that 2 Peter is 'probably a 2nd century forgery.' He doesn't seem to see that their reasons for claiming that are specious, motivated by a desire to do away with all the supernatural events of Scripture, such as the virgin birth of Christ. We should not naively accept claims from people (such as Henke himself) with such motives." Certainly, many skeptics of 2 Peter are liberal Christians or non-Christians. However, Dr. Humphreys' views of the Bible and Church history are no more accurate than his understanding of science or his use of pop psychology to "probe" my motives for opposing his nonsense. Dr. Humphreys simply handles the Bible and Church history in a simplistic and careless manner. First of all, he incorrectly mischaracterizes all critics of 2 Peter as liberal heretics and makes a bogus correlation between rejecting the authority of 2 Peter and opposing the supernatural, including the doctrine of the Virgin Birth. If this correlation is true, why did a significant number of Church Fathers that endorsed the Virgin Birth reject the authenticity of 2 Peter? For example, why did Origen raise doubts about its authenticity? Why do many modern Roman Catholic theologians enthusiastically embrace the Virgin Mary, but consider 2 Peter to be fraudulent? In particular, the Roman Catholic The New Jerusalem Bible endorses the Virgin Birth, but refers to the Petrine authorship of 2 Peter as "doubtful," a "forgery," and its contents "suggest a later date" (p. 1995). As usual, Dr. Humphreys' simplistic black and white view of the world does not represent reality. Dr. Humphreys and his YEC allies so desire to get as much mileage out of their false interpretations of this forged New Testament book that they can't afford to let the real context or historical facts about the book get in their way. Rather than quoting a spurious book and accusing others of illegitimate uniformitarianism, Dr. Humphreys needs to deal with and not ignore his own Lyell uniformitarian blind spots, which I documented above. He clearly fails to realize that geologists abandoned Lyell uniformitarianism for actualism long ago and that a few sentences from a fraudulent 2nd century manuscript had nothing to do with it. In context, the verses of 2 Peter have nothing to do with geology and because they're probably the words of a forger, not even YECs should take them seriously. "Last, Henke would not like to hear that I have based a theory on the creation of planetary magnetic fields (Humphreys, 1984) - on part of the passage (2 Peter 3:5) he disparages, and that NASA spacecraft have confirmed the scientific predictions of that theory (Humphreys, 1990)." "...the earth was formed out of water and by water." For Dr. Humphreys, God had no problem invoking a few miracles to keep water liquefied in the vacuum of space and then converting it into everything from hydrogen to uranium. However, does Dr. Humphreys have ANY evidence to support these miraculous claims? Does he have a shred of evidence that all matter in our Solar System magically came from water? As usual, the answers are no. Humphreys (1990) makes up some stories about God interacting with water molecules and invokes some cursory and inaccurate claims about the inadequacy of modern models of magnetic dynamos. Dr. Humphreys then expects his readers to accept his claims that modern scientific models should be replaced with his magical fantasies. Unlike Dr. Humphreys' aquatic alchemy, Van Allen and Bagenal (1999) present far more coherent and realistic views of what is known and unknown about planetary magnetic fields. Chapter 2 in Faure (1998) and Delsemme (1998) further demonstrate that the distribution of elements in the Universe (including the Oddo-Harkins rule and H/He ratios) is consistent with the Big Bang and nuclear fusion reactions in stars. That is, nuclear fusion reactions in stars, and not Dr. Humphreys' aquatic myths, explain why oxygen-16 is more abundant in nature than oxygen-17 or oxygen-18. "By the same laws, the currents and fields would preserve themselves with only minor losses, as God rapidly transformed the water into other materials." In the same sentence, Humphreys (1990) talks about two contradictory concepts: natural laws and supernatural intervention. Dr. Humphreys is stuck in the old Gosse Hypothesis trap. How can Dr. Humphreys' "science" ever distinguish between what is a product of nature and what is supposedly supernatural? Physicist Tim Thompson concisely demonstrates that Dr. Humphreys' aquatic alchemy and its "predictions" amount to nothing. He shows that Dr. Humphreys' equations and variables are so plastic that they could be used to support any planetary magnetic field hypothesis. To be exact, Humphreys (1984) was only willing to "predict" that the current magnetic moments of Uranus and Neptune would be "on the order of 1024 J/T" (joules/tesla). These "predictions" are nothing more than obvious guesses that could have been made by anyone that recognized that the magnetic moment of a planet is often related to its mass. Because the masses of Neptune and Uranus are similar to each other and intermediate between the masses of Saturn and the Earth, we would expect the magnetic moments of Uranus and Neptune also to be similar and somewhere between those of the Earth and Saturn. The magnetic dipole moments in joules/tesla (J/T) and the masses in kilograms of Jupiter, Saturn and the Earth were taken from Tables I and II in Humphreys (1984) and plotted as diamonds in Figure 8. The trend line for these three points was calculated and inserted into the graph. The predicted dipole moments for Uranus and Neptune based on the trend line and their known masses are shown as red circles. According to the trend line, the predicted magnetic moment for Uranus is 5.1 x 1024 J/T, whereas the predicted value for Neptune is 6.7 × 1024 J/T. The actual measurements from Tim Thompson are very close to my predictions (3.7 × 1024 J/T for Uranus and 2.1 × 1024 J/T for Neptune) and appear as black triangles in Figure 8. The graph shows that anyone could estimate the magnetic moments of Uranus and Neptune by simply knowing their masses and using the trend line in Figure 8. A Bible and Dr. Humphreys' aquatic alchemy are not required. Because the Bible contains many verses that are not scientifically literal, such as Job 38:37, which claims that God stores rainwater in bottles in the heavens, we should not be surprised when it does not explain the origins of planetary magnetic fields or zircons. As most wise theologians admit, the Bible is not a book of science. Figure 8. 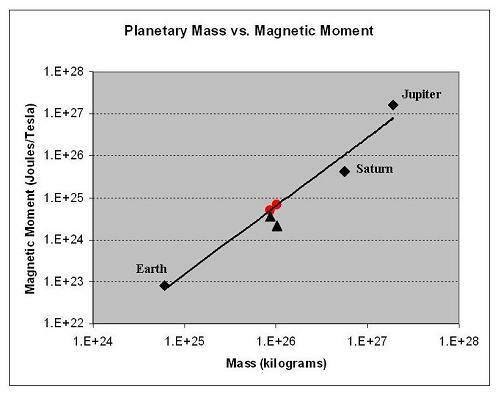 The magnetic moments in joules/tesla (J/T) and masses in kilograms of Jupiter, Saturn and the Earth are plotted as diamonds. The trend line for these three points was calculated and inserted into the graph. The predicted magnetic moments for Uranus and Neptune based on the trend line and their known masses are shown as red circles. The actual measurements are plotted as triangles. The graph shows that anyone could accurately estimate the magnetic moments of Uranus and Neptune by simply knowing their masses and using the trend line. A Bible and Dr. Humphreys' aquatic alchemy are not required. I readily admit that throughout this and my other essays that I am very critical of the Bible and the actions and beliefs of young-Earth creationists (YECs). Humphreys (2005) refers to my blunt criticism as "mudslinging." Considering that my original essay made specific recommendations to allow Dr. Humphreys to improve his work (e.g., look for 3He in the Fenton Hill zircons), that I thoroughly documented my calculations and statements in great detail (as examples, my Appendices A and B) and because of Dr. Humphreys' inexcusable mismanagement of his data and data from the literature (Magomedov, 1970 and Lippolt and Weigel, 1988), I would argue that my comments were justified and not mudslinging. Nevertheless, one person's mudslinging is another's forthright critique. Unlike the scientific method, "mudslinging" is often a matter of taste or in the words of Dr. Humphreys: "There's no disputing about taste." In contrast, Dr. Humphreys thinks that he can defend his work by simply holding up his deceptive Figure 2 and then write a superficial note that largely attacks my former religious beliefs rather than dealing with his mystery math, his invalid Lyell uniformitarianism and other deficiencies in his work. I would argue that if Dr. Humphreys or anyone else wants to really see spiteful mudslinging, desperation, groundless arguments, and sparse linking to the webpages of opponents out of fear of their arguments, one only has to read Humphreys (2005). A lot of Humphreys (2005) contains baseless speculation on my former beliefs and current motives for criticizing his work. Dr. Humphrey's mistreatment of science and church history is only exceeded by his outrageous and false accusations against strangers that dare to disagree with his methods and conclusions. If Dr. Humphreys had really wanted to lecture on my motives for abandoning fundamentalism, he should have read my deconversion testimony in Ed Babinski's: Leaving the Fold or emailed me a list of questions. Instead, Dr. Humphreys chose to mix biblical literalism and pop psychology to completely misrepresent me, why I once embraced fundamentalist Christianity, why I abandoned it, and why I oppose his irrational agenda. Humphreys (2005) confesses that he relied on "a lot of guesswork" to supposedly understand my motives for criticizing his work. He then proceeds to attack my character on the sole basis of his Bible and a few sentences of my brief review of Leaving the Fold at Amazon.com. Fundamentalists often build entire doctrines and imaginative scenarios from sentence fragments in the Bible, so I guess that I shouldn't be surprised with how Dr. Humphreys completely mishandled the phrase "after I read the Bible" in my Amazon.com review. Nevertheless, what kind of a person believes that he can know the motives of a stranger by reading a brief book review and using the Bible as a crystal ball? "So it is possible that Henke did not have enough initial exposure to the word of God to be born "from above" (literal Greek of John 3:3) and merely made a shallow commitment to someone other than the real Jesus Christ—perhaps to a human authority figure, such as a parent, teacher, or pastor. Later on, when he encountered different authority figures, perhaps skeptic professors or persuasive friends, he then transferred his commitment to them, especially since their view was obviously the consensus." Contrary to Dr. Humphreys' fables, my conversion and deconversion were completely sincere. When I became a born-again Christian, I was an adult and knew what I was doing. I remained a sincere fundamentalist/evangelical Christian for many years. Dr. Humphreys, who doesn't even know me, has absolutely no justification telling me or anyone else otherwise. This is YEC arrogance at its worst. Obviously, Dr. Humphreys views me as a serious threat. He even refers to me as among the "worst enemies of creationism." In reality, fundamentalism is its own worst enemy because it denies reality or tries to explain it away. Too many fundamentalists don't want to hear and they don't want others to hear that their scriptures are not absolute truth and that for millions of people their religion fails to provide answers for life or deal realistically with death. So a few frightened fundamentalists will stoop to any libel to discredit people who have honestly been devout Christians and found it wanting. These fundamentalist extremists search their scriptures and if they find something to slander their opponents, they can always justify using it. They simply assume that whatever their scriptures say, by definition, must be true. While most Christians (including many of my fundamentalist friends) can separate faith from science and place love above dogma, too many YECs and other fundamentalists cannot. As an ex-fundamentalist, I know that some of them live in constant fear that if only one verse in their Bible is shown to be inaccurate or if they can't discredit the next fossil in Science , their entire faith will collapse. This is a pitiful way for any individual to live – full of terror and desperately seeking any excuse to smear science and the actions of anyone that dares to see the world differently. Rather than calling on people to live better and more loving lives, individuals like Dr. Humphreys set a terrible example by distorting data and the lives of former believers that now sincerely disagree with them. The spite and contempt that some YECs have for former believers demonstrate the ineffectiveness of their false religion to change the lives of these individuals for the better. They are the 21st century Pharisees that value fake science and illegitimate scriptural interpretations more than love and compassion for individuals. No wonder, countless individuals that were once with them, now walk away and millions more shun them. I did not write this or my earlier essay because of any delusional speculations in Humphreys (2005) that I was trying to reassure myself that I was correct in rejecting the Bible many years ago. I wrote it out of anger. Dr. Humphreys and his allies have repeatedly attacked my profession. Geologists work hard. We get oil and ores from the Earth to support our civilization. We develop and test technologies to cleanup soils and water. Over the past 200 years, we've developed a coherent and consistent view of Earth history. Rather than being thanked for deciphering the Earth's history, a small group of fundamentalists spit in our faces and tell us that historical geology is no better than a myth. They open their Bibles and without really looking at the Earth proclaim that they know better. They then spread their delusions and slanders into the general population. My anger is not with the vast majority of Christians (including many fundamentalists) that lead morale lives, properly recognize and criticize evil when they see it, and encourage others to be loving and honest. My battle is with arrogant know-it-alls that claim to speak for God, try to tell me how to do my work, and then attempt to hijack my profession and the other sciences for their religious or political agendas. This not only includes YECs like Dr. Humphreys, but also astrologers, water witches, advocates of petroleum conspiracies, and medical quacks. Nobody likes their noble profession degraded. I'm simply tired of being told how to do my research by a bunch of ignorant individuals that have never left the 17th century and use Bibles to analyze outcrops. Despite enthusiastic endorsements by numerous YECs, the "helium diffusion studies" in Humphreys et al. (2003a,b; 2004), and Humphreys (2003) are based on many flawed arguments, ad hoc miracles, invalid assumptions, untrustworthy equations, and questionable data. Rather than properly deal with the numerous problems in his work, Humphreys (2005) refers to my detailed criticisms as "a torrent of hot air." However, based on the numerous repetitive arguments in Humphreys (2005), it's obvious that he never bothered to read or understand most of my criticisms or references. That is, he keeps making the same erroneous statements over and over again even though I thoroughly documented and refuted them in my original essay (e.g., refusing to recognize the presence of gneisses in his samples, failing to recognize possible contamination of his zircons with extraneous helium during cooling and not heating episodes, ignoring my Appendix B and its more realistic Q/Q0 results, using the wrong ("biased") equation to calculate standard deviations, etc.). Rather than providing thorough answers, Humphreys (2005) exposes even more inadequacies in his laboratory methods (trying to identify rocks by merely relying on naked-eye observations, improper naming of rock units, sloppy handling of units of measure in Appendix C of Humphreys et al., 2003a, etc.). Contrary to Humphreys' claims that I'm trying "to bury truth under a mountain of minutiae," I've documented in great detail that his studies are full of numerous holes that completely undermine the credibility of his work. In response, Dr. Humphreys only chooses to brush off his errors as trivial, simple typos, or as R. Gentry's fault. I also show that Dr. Humphreys' miracle-based misconceptions about the ages of the Fenton Hill rocks are probably due to his misapplying laboratory vacuum helium diffusion data to the high-pressure subsurface conditions at Fenton Hill, ignoring the possibility of extraneous helium contamination in his zircons, and/or severely underestimating the Q0 values and the amounts of uranium and thorium in his zircons. While Dr. Humphreys often pontificates without providing any details, I have nothing to hide and I present all of my arguments out in the open and in suitable detail. Humphreys (2005) thinks that he can just read through my abstract, throw out some insults, try to trivialize his serious mistakes, invoke a few more groundless fantasies, make a couple of corrections here and there, ignore the details, promise great things in the future, repeatedly rely on his deceptive Figure 2, and then hope that his readers will just go away on faith. Well, science doesn't work that way and Dr. Humphreys should know better. Dr. Humphreys has had more than two years to make a thorough and air tight case for his claims. As explained in this and my earlier essay, he has wasted a lot of time and money, and has utterly failed to do so. Instead of dealing with his numerous scientific mistakes, Dr. Humphreys makes up stories in Humphreys (2005) to attack my sincerity and personal beliefs. While I've had gracious, but frank, discussions with Dr. Guy Berthault, Dr. David Plaisted, Dr. John Baumgardner and many others that strongly disagree with my views, Humphreys (2005) is not science and represents the worst of young-Earth creationism. Internet comments on Humphreys et al. (2003a,b) and Humphreys (2003) by "WeHappyFew", Dr. Joseph G. Meert, and Jack DeBaun were exceptionally insightful. Dr. John Baumgardner kindly provided helpful information on Dr. Humphreys' samples. A number of peer-reviewers and other individuals provided valuable comments on various drafts of this essay, including: Tom Baillieu, Tom Bridgman, John Brawley, Paul Heinrich, Mike Hopkins, Mark Isaak, Mark D. Kluge, Ted Lawry and Frank Lovell.